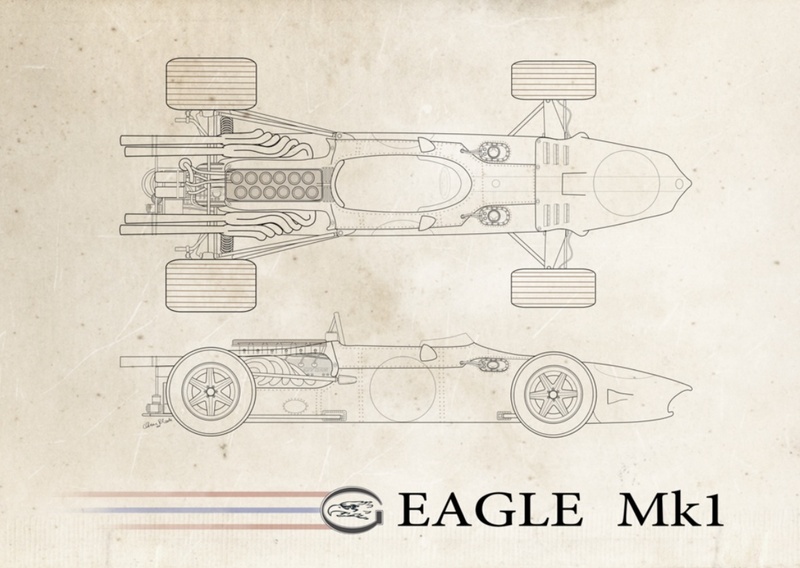 The Eagle marque was formed when Carroll Shelby suggested Dan as an alternative to Goodyear when the corporate tyre giant determined to avoid a repeat of the Indy tyre debacle of 1964 when Goodyear shod users fitted Firestones for the race. Goodyear were looking to fund an outfit to build cars in a manner which gave them some control to avoid such a corporate embarrassment again. 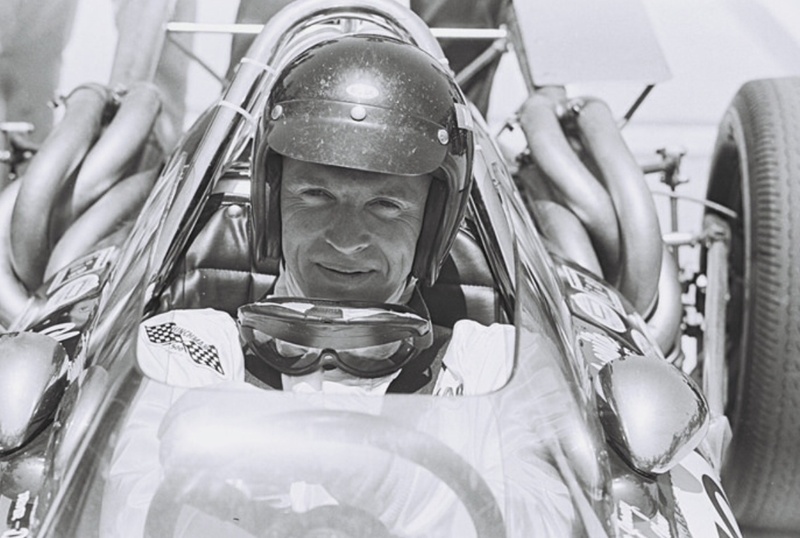 Shelby was committed with his other business ventures but became a partner in All American Racers until Dan and Evie Gurney bought out his interest in 1970. 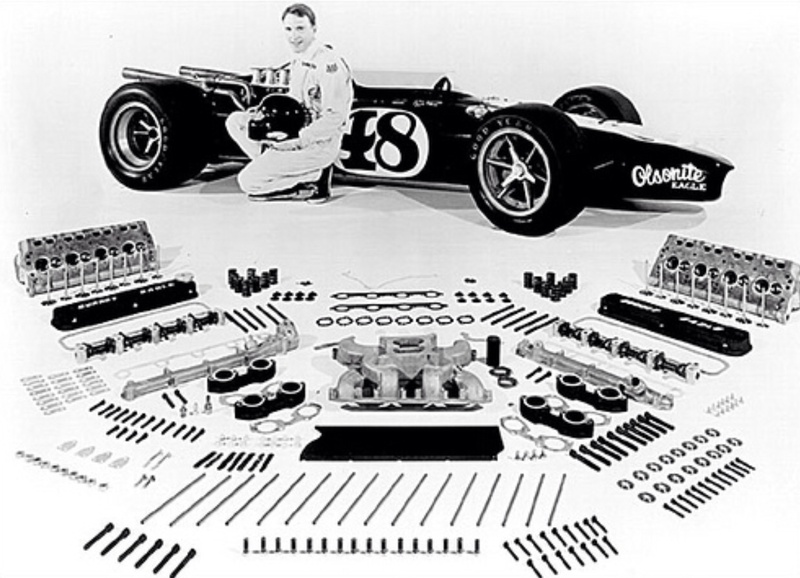 Gurney was given responsibility for setting up the business inclusive of finding premises, people and machinery to build Indycars. 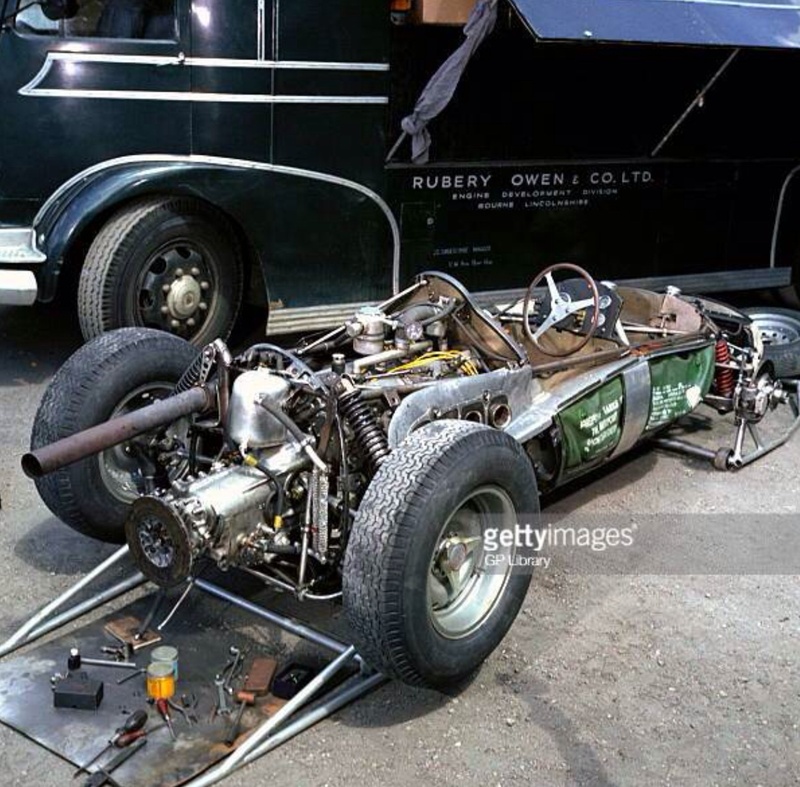 Simultaneously Gurney secured support to build a GP car in parallel with the Indy contender. Len Terry, chosen by Dan as the Designer off the back of their time together at Lotus noted that the teams priority was the build of the Indycar variant of what was, with relatively minor modifications to engine, (3/4.2 litre GP/USAC) gearbox and thickness of aluminium used for the monocoque chassis a common, winning design for both USAC and GP racing. 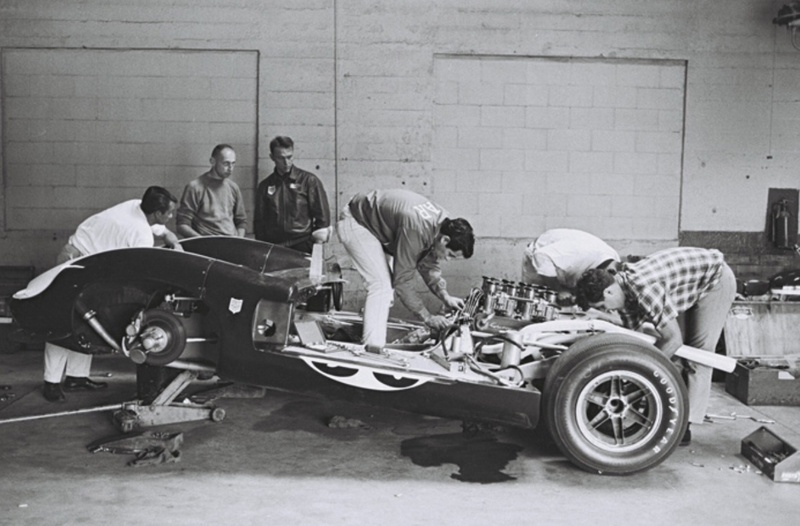 Terry worked on the cars conception, strongly based on his 1965 Indy winning Lotus 38, in the summer of 1965 in the UK, and at the end of September went to California to begin drawing the cars. What made me chuckle was looking at a photo of the 2.7 litre Coventry Climax ‘Indy’ FPF in the back of Mk1 chassis ‘101’ on the same day that I was fossicking through some Repco records given to me by Rodway Wolfe and Michael Gasking and seeing AAR listed in the July 1966 Repco Brabham Engines Pty Ltd monthly management report’s sales listing. 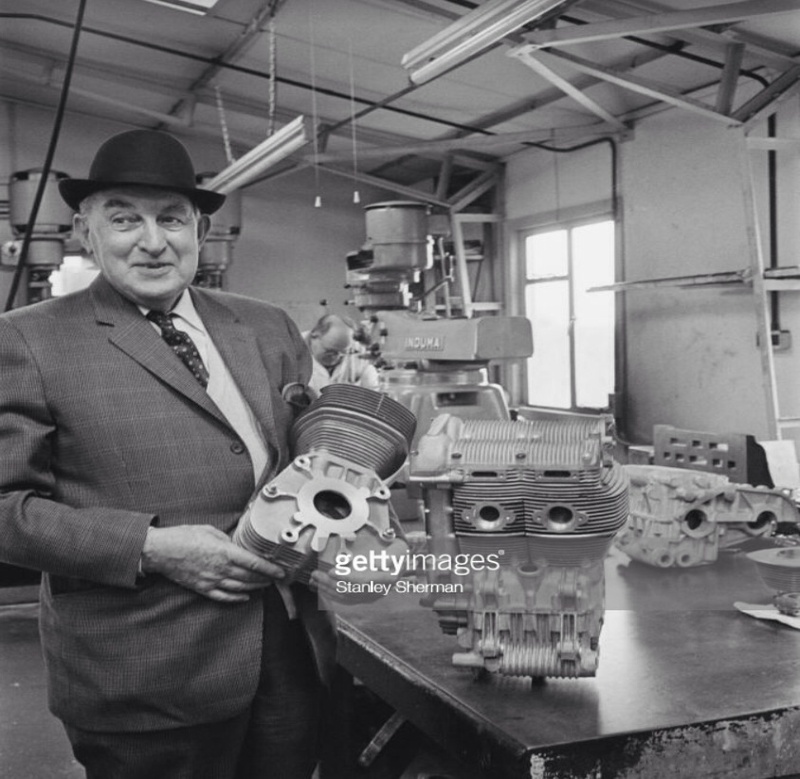 By that stage RBE had commercial rights or agreement from Coventry Climax to rebuild the engines and provide parts- pistons, rings, bearings and other components. 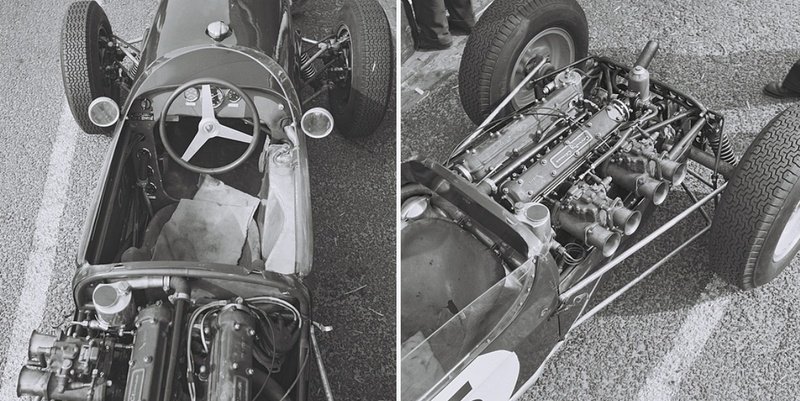 Given the Type 56 Gurney-Weslake V12 was not yet completed Dan bought an FPF and plenty of bits from RBE to tide him over until the quintessential Eagle Mk1 V12 made its race debut at Monza in September 1966. Despite being out-powered by the new engines used by others in that first 3 litre F1 year, the compact, four-cylinder, but not necessarily light car took Dan to a non-classified seventh from grid fifteen. The car completed 23 of the 28 laps in its very wet debut at Spa in June 1966. This is the infamous race which took out a good share of the field due to a sudden ‘heavy wall of water’ at Burnenville on the first lap. The combination was fast all things considered- Reims Q14 and 5th, Brands Q3 and DNF, Zandvoort Q4 and DNF and at the Nürburgring Q8 and 7th. Pretty good against all the multi-cylinder heavy metal. Acquired by Castrol at the seasons end the machine raced on in the hands of Al Pease before being later bought by Tom Wheatcroft for his Donington Collection where it lived until recently. 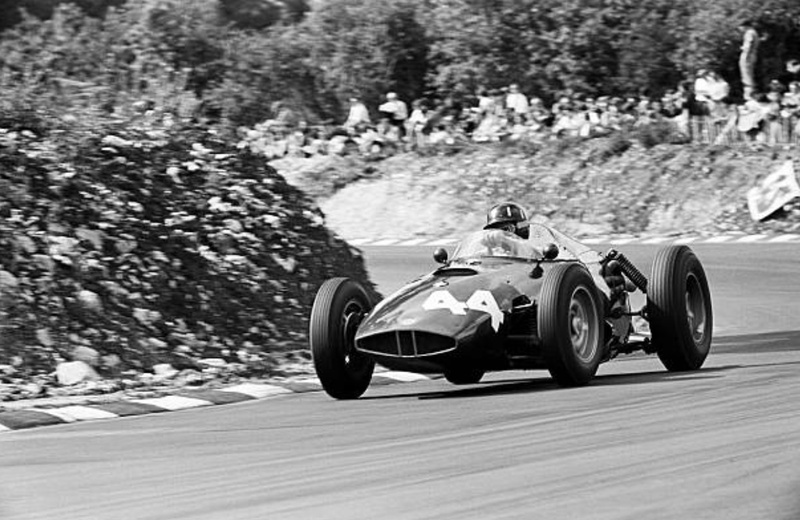 The shot above shows Dan fettling the FPF on it’s very first day of testing at Brands Hatch on 8 May 1966. By that stage the design was sorted as Gurney had already raced the Mk2 Indycar variant. The main initial issue with the chassis was excessive ‘wandering’ and instability at speed which was diagnosed as related to the anti-dive suspension geometry- this was expediently fixed by dialling that out of the cars specification. 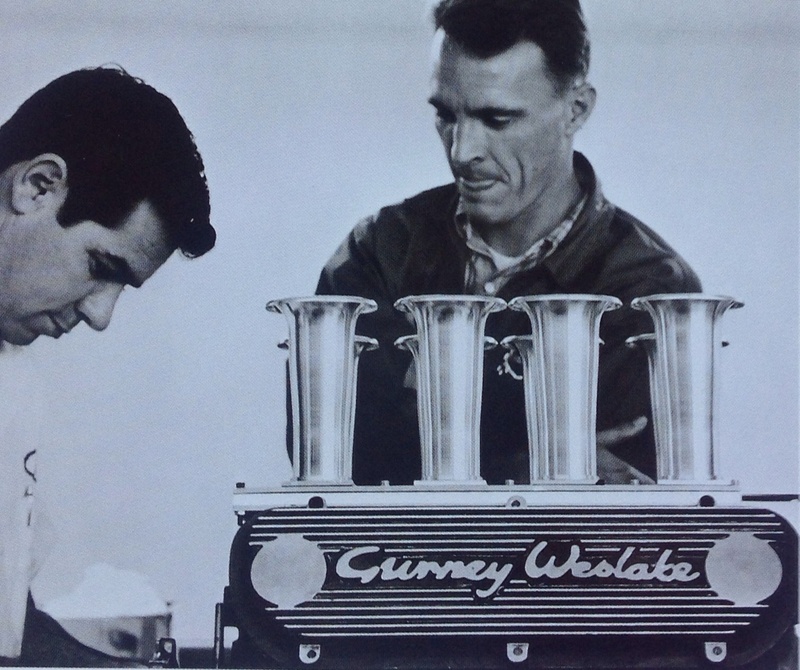 Gurney first got to know Len Terry when they worked together in adapting the small-block Ford V8 to a Lotus 19 sportscar. 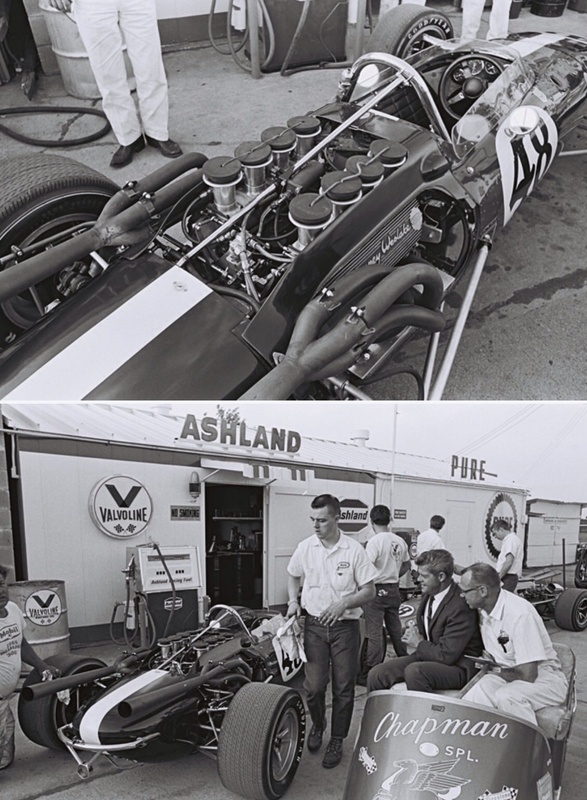 By the time Terry’s Lotus 38 Ford won the 1965 Indy 500 in Jim Clark’s hands Len had already committed to work with AAR for 1966. 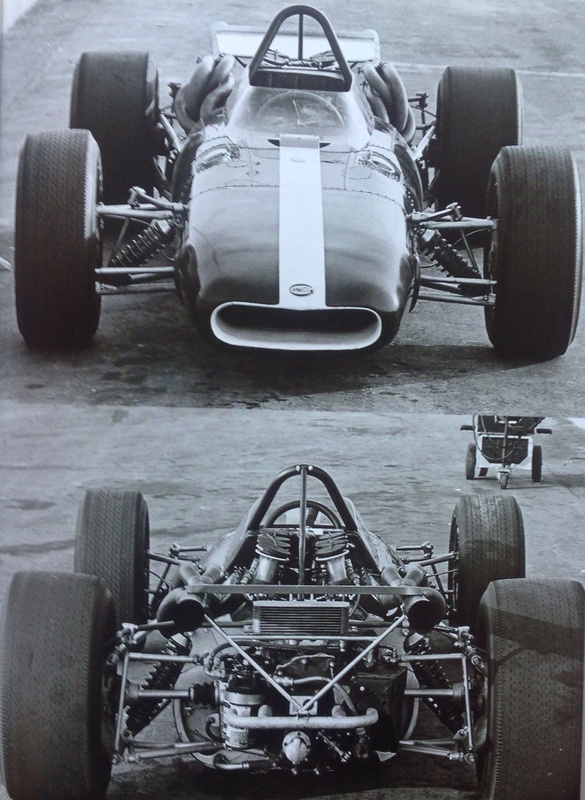 The car (both the drawing and cutaway above, V12 engined obviously) which drew heavily on his Lotus learnings was based on an enormously strong full-monocoque aluminium chassis in 18 gauge sheet for F1, and the heavier 16 gauge sheet mandated by the USAC, for Indycar use making the latter about 50 pounds heavier than the F1 machine. Bulkheads at the drivers feet, dash, seat and at the rear of the car added structural rigidity. Suspension up front was period typical- a top rocker and lower wishbone with an inboard mounted coil spring/damper and outboard at the rear- single top link, inverted lower wishbone, two leading radius rods and coil spring damper. Roll bars were adjustable, steering rack and pinion and uprights front and rear made of magnesium-zirconium alloy. Disc brake rotors were 12.25 inch diameter Girlings, who also provided the calipers. 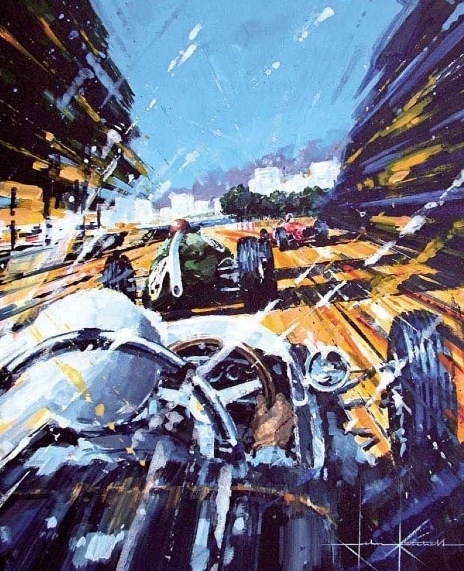 The design’s wins included two F1 events-the non-championship Race of Champions at Brands Hatch in March 1967, Dan won both heats and the final from Bandini’s Ferrari 312 and Siffert’s Cooper T81 Maserati. 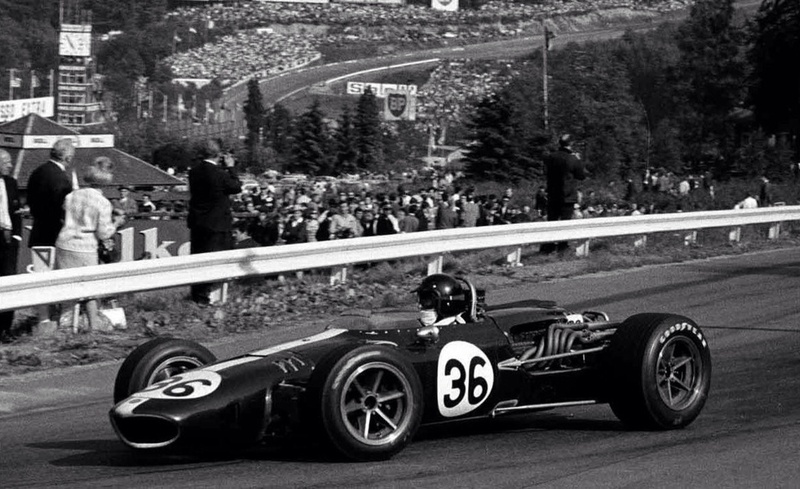 Lets not forget that memorable 1967 Belgian Grand Prix at Spa. 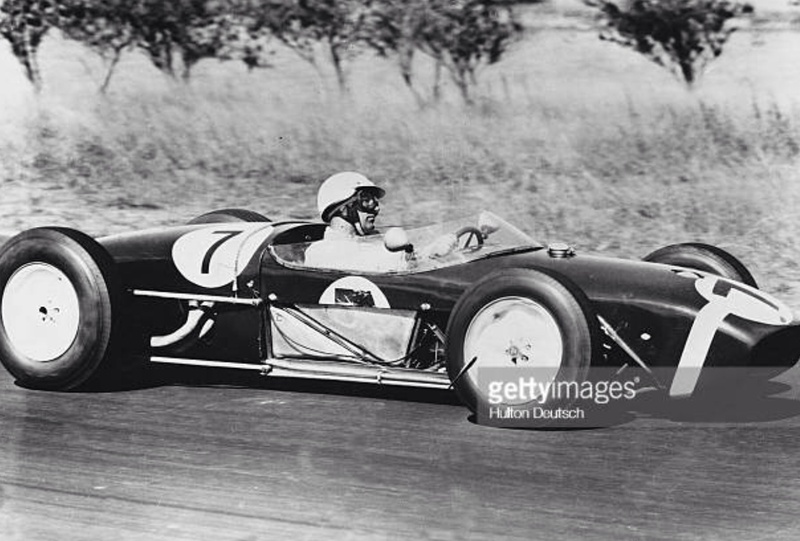 On that June day Dan joined Jack Brabham as the second man to win a Grand Prix in a car of his own construction- an honour also achieved by Bruce McLaren at Spa twelve months after Gurney. In Indy racing the cars won many races and in Mk3 specification Bobby Unser won the 500 in 1968, his chassis powered by the venerable turbo-charged, four cylinder Offy. Posted: November 15, 2018 in Fotos, Who,What,Where & When...? 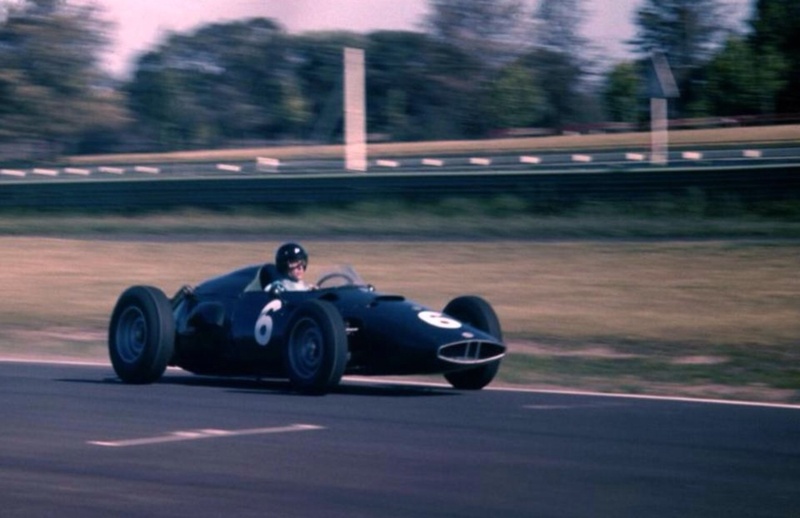 Jack didn’t figure in the race with fuel dramas, it was won by Stirling Moss’ Rob Walker Lotus 18 Climax from Innes Ireland’s similar works machine and Bib Stillwell’s Cooper T51 Climax. 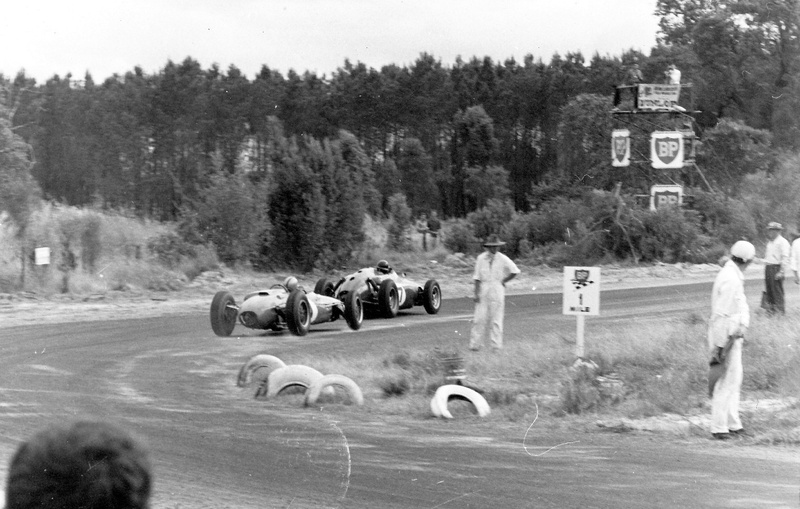 Moss, Gurney and Hill are on the front row, the latter two fellas in BRM P48’s. 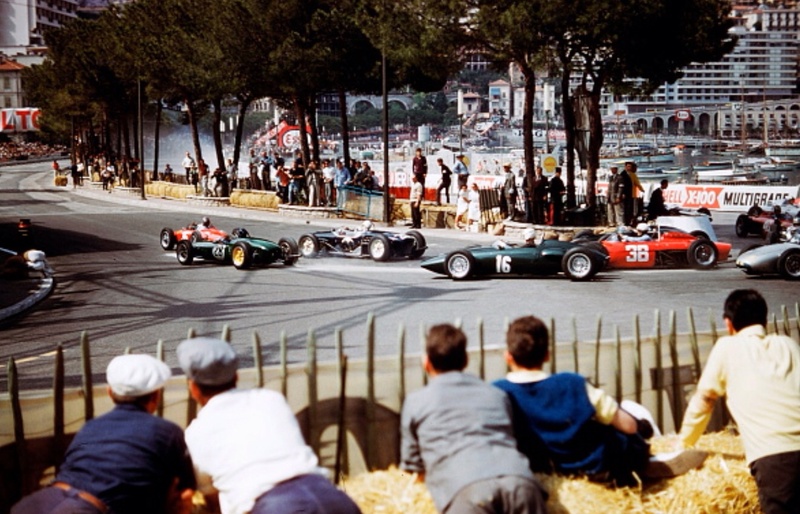 Ireland and Brabham, to the right, are on row two. Row three comprises Ron Flockhart, Austin Miller and Bib Stillwell in T51’s, with row four again T51’s in the hands of Bill Patterson and Alec Mildren. Fourth to and fifth places were bagged by Miller and Flockhart with the rest of the starters, nine cars, failing to finish the 45 laps in a race of attrition run in scorching, humid, Sydney heat. He is right of course. 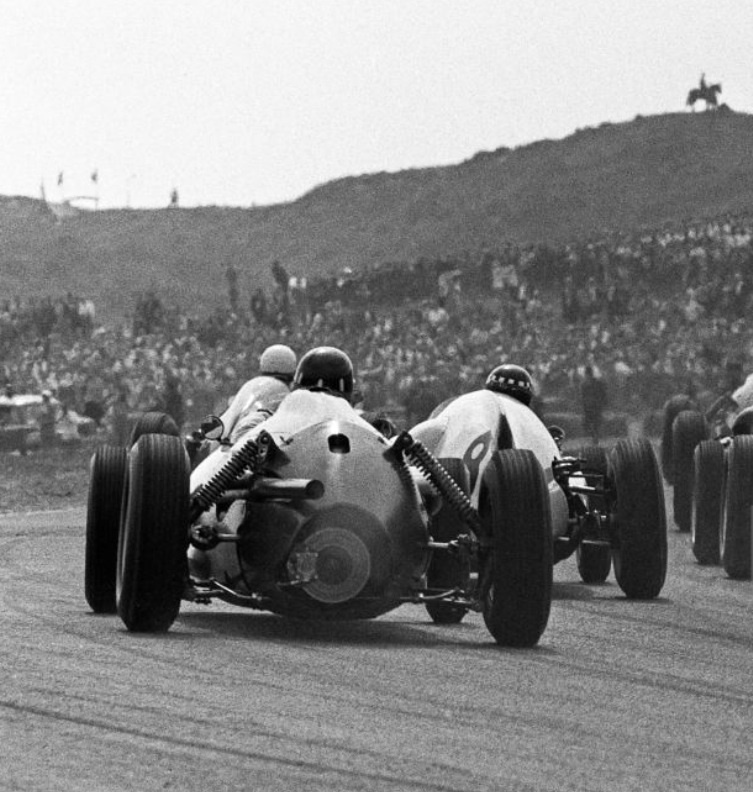 Every era of motor racing is interesting, the challenge is to keep up. But I must say, as a humanities graduate, the physics of kinetic recovery systems and the like is simply beyond the conceptual capacity of my noggin. No way can I write about it as I simply don’t geddit. During the same research session that i was reading about McLaren’s use of 3D-Printing (announced April 2017) to more quickly design and deploy components on their cars- hydraulic line bracket, rear wing flap, radio harness boot and carbon fibre brake ducts to be specific, i also found some photos of those designer/builders Messrs Brabham, Gurney and Surtees. I smiled to myself at the thought of those inveterate fettlers, fiddlers and finessers of racing cars and the manner and pace at which they would have used the tools of today. Its Dan Gurney bearing down on Jack who is just pulling his Brabham BT24 Repco up in the 1967 Monza pitlane having tried the ‘cockpit streamliner’ he and Ron Tauranac concocted to squeeze a few more top speed revs out of the reliable- but not as powerful as the new-fangled Ford Cosworth DFV V8 in the hands of Clark and Hill, Repco SOHC ‘740 Series’ V8. Dan is anxious to know the response of his mate and former employer, his own F1 experiment is about halfway through its life at this point. The Gurney-Weslake V12 engined variant of Len Terry’s Eagle Mk1 design (#10 in the pitlane- the car behind Dan’s is the Eagle raced by Ludovico Scarfiotti) made its debut at this very race meeting twelve months before. ‘Black Jack’- he of the permanent 5 o’clock shadow, would have driven Tauranac bonkers with the 3D technology and his ideas- imagine what Colin Chapman, always a man of the future and of overnight tweaks would have done with it! Meanwhile at Warwick Farm John Surtees is looking for a way to get a few tenths out of his Surtees TS8 Chevy F5000 car during practice for the 1971 Australian Grand Prix at Warwick Farm. One of the reasons Alan Jones left Surtees was just how painful ‘Big John’ was with car adjustments he ‘knew would not make the car quicker’ observed Jones of Surtees attitude on Jones requested TS19 chassis changes- despite Surtees ‘pottering around 2 seconds off the pace’ whilst forming his views. The beauty of the 3D production process is the cost-effective manner in which (some) ideas can be tried, something all three of the impecunious owner/engineer/drivers mentioned would have approved. 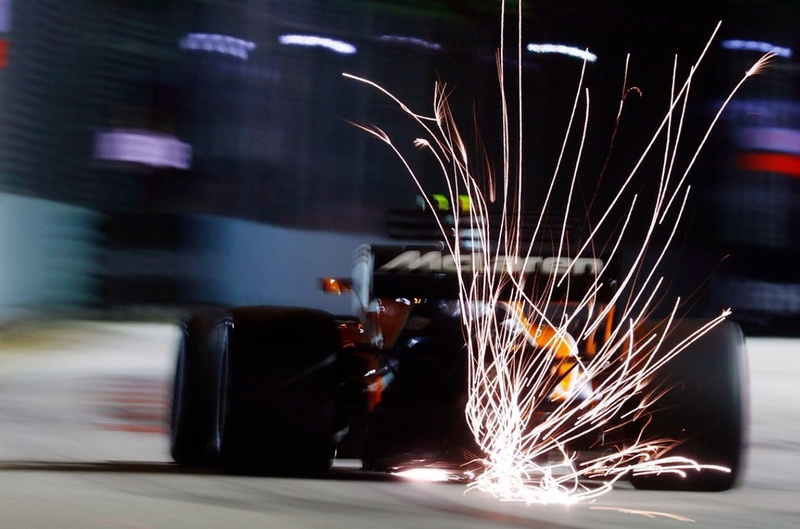 There is no reason why engineer/drivers are not in F1 now, either in a formally qualified manner or via the ‘school of hard knocks’ but so far no-one has challenged an article i wrote a while back which anointed Larry Perkins as the last of the engineer/mechanic/racers at F1 level? 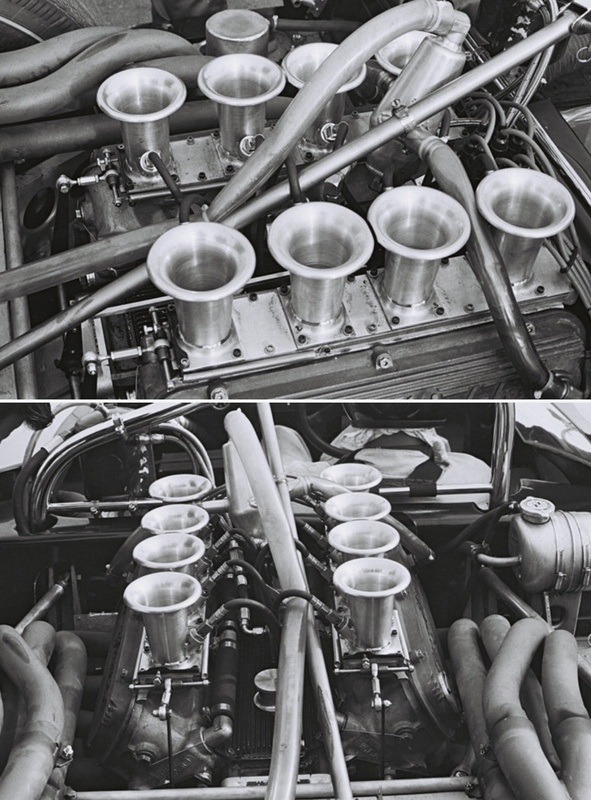 The Gurney-Weslake combination is best known for the Formula 1 60 degree, DOHC, four valve, Lucas injected V12 which was fitted into the gorgeous Eagle Mk1 created by Len Terry and Dan in 1966- initially fitted with a Coventry Climax 2.7 litre ‘Indy’ FPF four cylinder engine, the V12 finally raced at Monza in 1966 and won its only GP, at Spa in mid 1967. 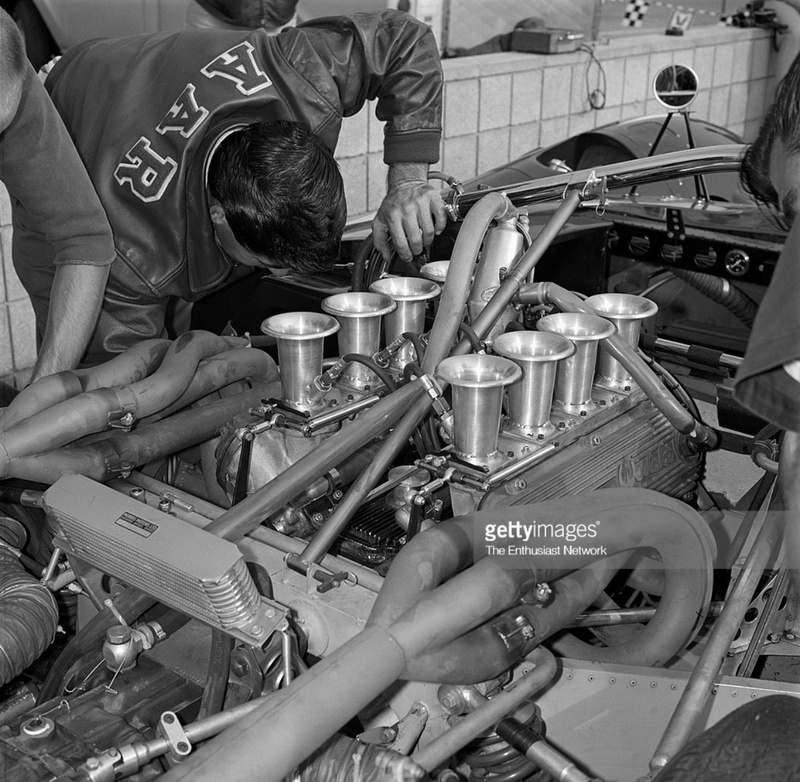 But the F1 project resulted from the relationship which arose from the development of special cylinder heads for the pushrod small-block Ford V8 a little earlier. 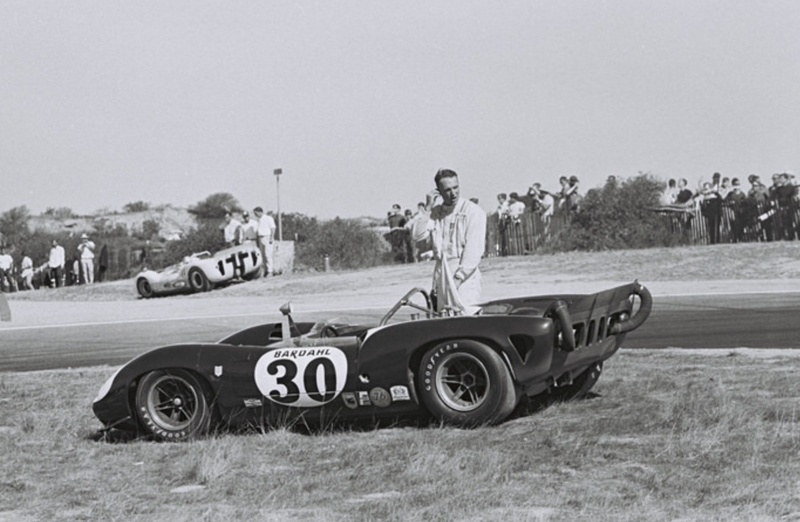 Gurney was keen to better exploit the performance potential of the small-block 289 cid Ford V8 with which he was so familiar from his AC Shelby Cobra, Ford GT40 and Can Am experiences. This engine family was the same as that which provided the first 255 cid pushrod engines used by Team Lotus at Indy in the rear of Lotus 29’s raced by Dan and Jim Clark in 1963. Whilst Dan’s plan was initially to get more competitive engines for the Sports Car Club of America’s burgeoning sportscar races, which would of course become the Can-Am Championship from 1966, the Gurney-Weslake V8 engines ultimately won the 24 Hours of Le Mans and races in Group 7 sportscars and Indycar single-seater categories and beyond. 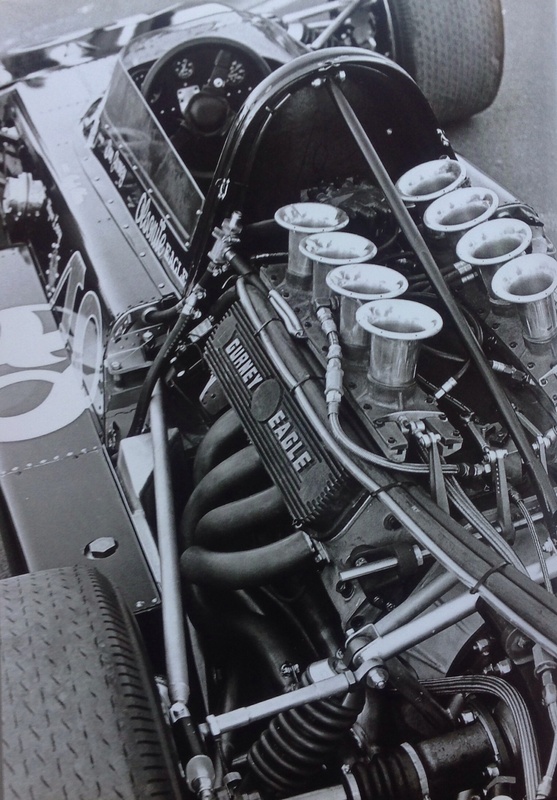 Dan had seen what Keith Duckworth had done with pushrod Ford engines in the UK- 100 bhp per litre, and figured the same approach could be successfully applied to the Ford V8. ‘I heard that Duckworth had modified a four-cylinder Ford Anglia cylinder head by boring an inlet tract hole straight at the port, so it was a more direct shot and I believe that was the first time that a little four-cylinder 1000cc pushrod engine made 100 horsepower. It seemed to me to be a pretty neat thing to accomplish and, naturally, being inquisitive, I wondered if the same idea could be applied to a Ford V8, since it looked to me as though we could do something similar to the 289-302 style engine’. ‘Actually we began our inquest with an extensive rework of the existing 271 bhp heads. At the peak of our testing with the 271 hp cast iron heads on a 325 inch block, we were pulling as much as 448 hp on gasoline. It was about this time we figured a few improvements along the lines of a new head design might give us even more power, so we got after it’. Dan sought out Weslake Engineering just outside Rye near the East Sussex coast of England and via Production Manager Michael Daniel engaged them to do some drawings after Gurney delivered some 289 heads to be inspected, analysed and sectioned. Patterns were made and these first ‘Mark 1’ Gurney-Weslake heads were cast at Alcoa Aluminium’s foundry in Pennysylvania. 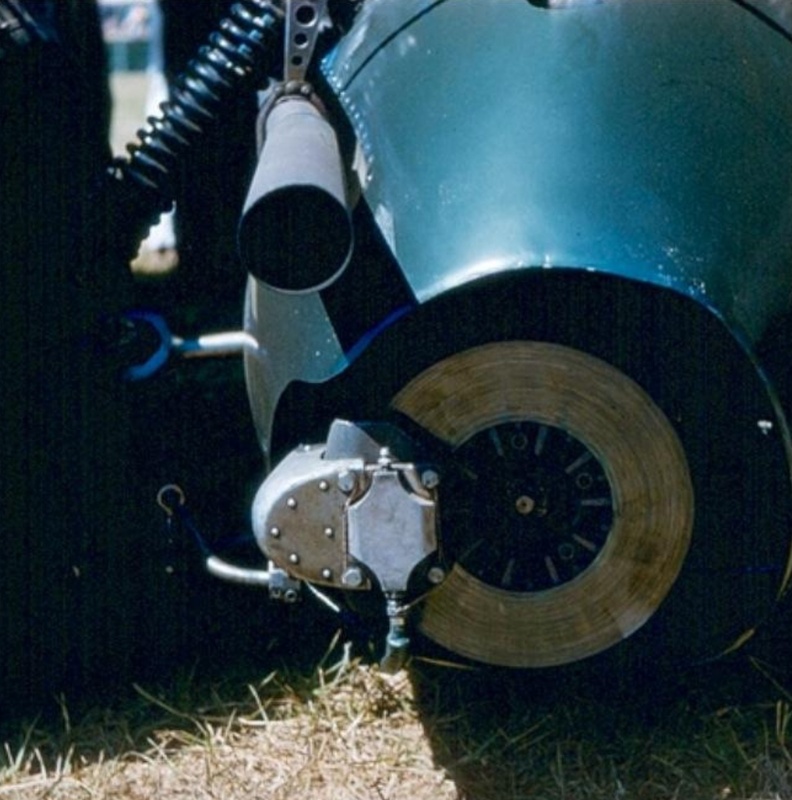 They featured circular inlet ports that provided a direct path from manifold interface to valve seat in order to get as much fuel-air mixture as possible into the combustion chambers. The valves were inclined at 9 degrees to the cylinder centreline instead of the 20 degree angle of the stock Ford heads. The valve guides were fitted with Perfect Circle teflon valve seals. Classic Weslake combustion chamber shapes were deployed- heart shaped with precision machined valve seat inserts- steel for the inlets and bronze for the exhausts, both press-fits into the heads. An immediate improvement of 70-100 bhp was achieved over the standard 289-302 heads both through the mid to upper rpm ranges without losing smoothness down low. To cope with the increased loadings the bottom end also ‘had a birthday’ with bits and pieces provided by well known suppliers of US performance gear. The Dearborn Crankshaft Corporation made a steel crank to AAR specifications which sat in bearings donated by the Ford DOHC Indy motor. Carrillo provided shot-peened conrods to which were attached Forged True pistons- compression ratios ranged from 10.5 to 11.6 to one. Jack Engle worked on cam grinds arriving at solutions which involved short lift and long duration with ‘rev springs’ fitted into the block’s oil galleries to assist the proper seating of the valves at high rpm. Ford’s stock high pressure oil pump was man enough for the job with stock oil pans baffled and main bearing girdles added to keep the whole lot stabile. 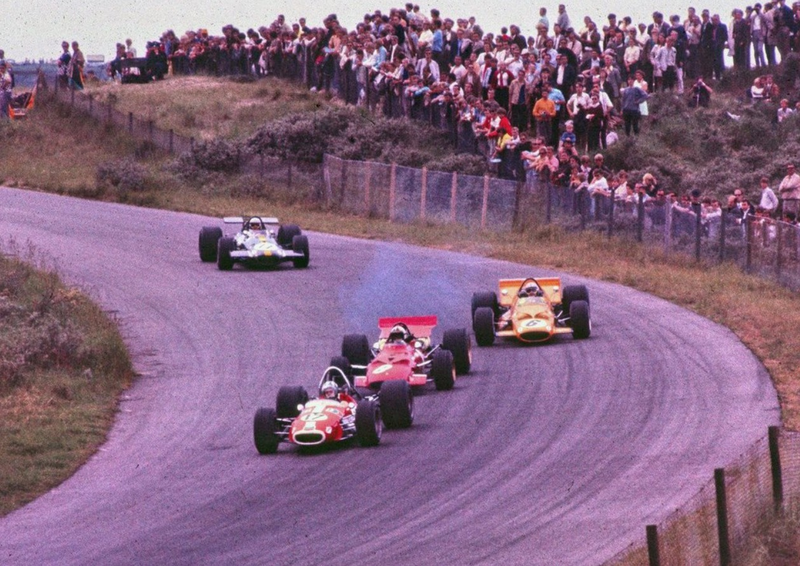 In an all-star cast which included Jim Clark, Bruce McLaren, Chris Amon, Hap Sharp, John Cannon, Peter Revson, Chuck Parsons, Jerry Titus, David Hobbs, Bob Bondurant, Parnelli Jones, Richie Ginther, Graham Hill, Jerry Grant, Walt Hansgen, and Dan (wow!- was there ever a better ‘Can-Am’ field of depth)- that race was won by Sharp’s Chaparral 2A Chev from Clark’s Lotus 40 Ford and McLaren’s McLaren Elva Mk2 Olds. Dan’s AAR McLaren was out with brake troubles on lap 24. By that stage of G-W development Mark 2 heads were fitted which incorporated improvements including removable rocker arm studs. ‘Mark 3’ Gurney Weslake heads were developed in 1966 with alterations to make assembly and maintenance easier. With this configuration AAR took their first GW head win in the May 1966 United States Road Racing Championship round at Bridghampton- Jerry Grant won in the AAR Lola T70 Ford from Lothar Motschenbacher’s McLaren Elva Mk2 Olds and Mike Goth in a McLaren Chev. The same chassis was used by Dan to win the Long Island, Bridghampton Can-Am round in September 1966- in a splendid weekend for All American Racers Dan popped the Lola T70 Mk2 on pole and won from the works McLaren M1B Chevs of McLaren and Amon. 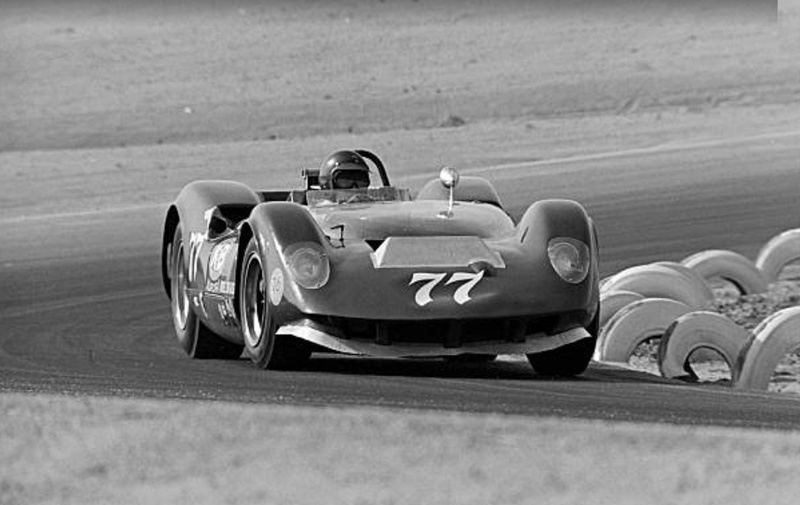 Sadly, it was the only Can-Am win for a Ford powered car. 495 bhp @ 7800 rpm was claimed at the time ‘The redline used to be 8000 rpm but I just found I could turn 8900’ Dan quipped after the race. Its interesting to look at the engine competition at the time. 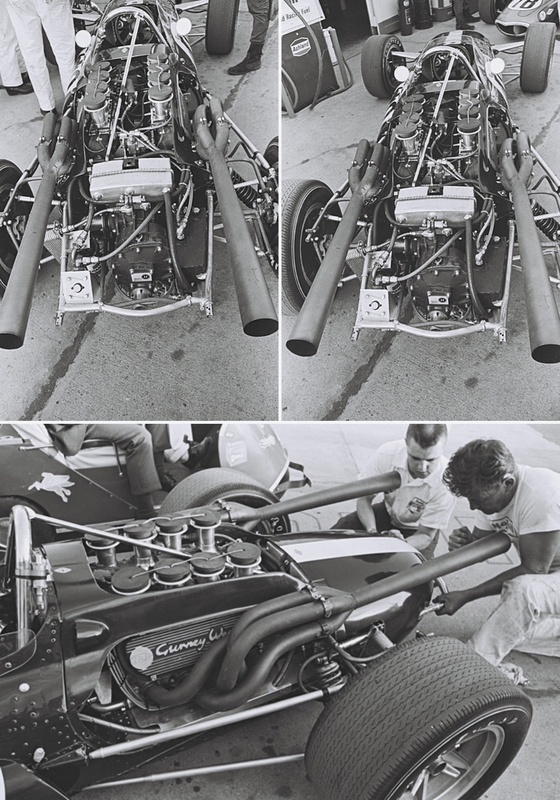 Pete Lyons in his bible ‘Can-Am’ writes ‘Chevrolet’s small block was the typical T70 engine of 1966, and those offered by well respected Traco Engineering in Los Angeles can be considered definitive. The bore remained standard at 4.0in but a stroker crank of 3.625in gave a displacement of 364.4 cid. 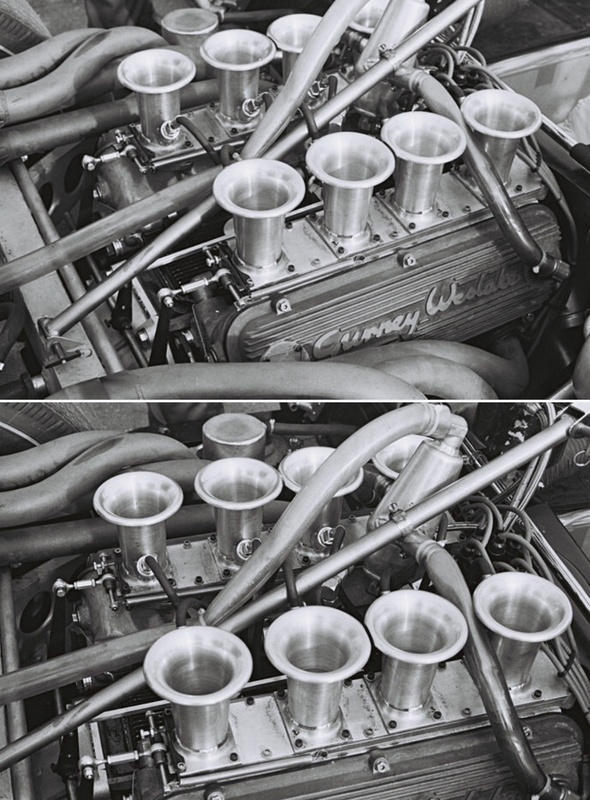 Breathing thorough a quartet of two-barrel 58mm Weber side-draft carburettors…such a package was rated at about 490bhp at 6800 rpm and 465 lb ft of torque at 4500…it weighed about 540-560 lbs. Price was just under $US5000’. 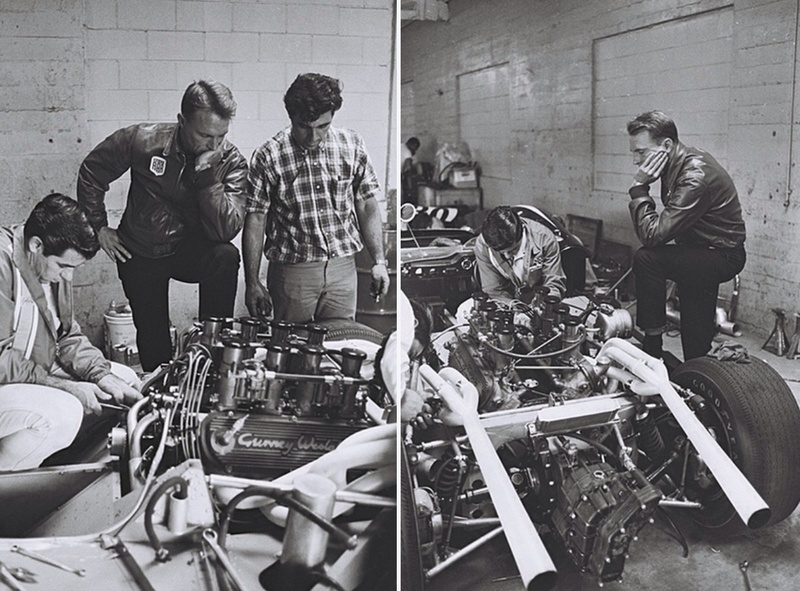 Towards the end of 1966 the engine was also fitted to the very first Eagle Indycar chassis- Mk2 ‘201’ which was raced by Dan in the ’66 Indy with a Ford 255cid DOHC motor- in fact Gurney didn’t complete a lap having been wiped out with eleven other cars in THAT famous collision. 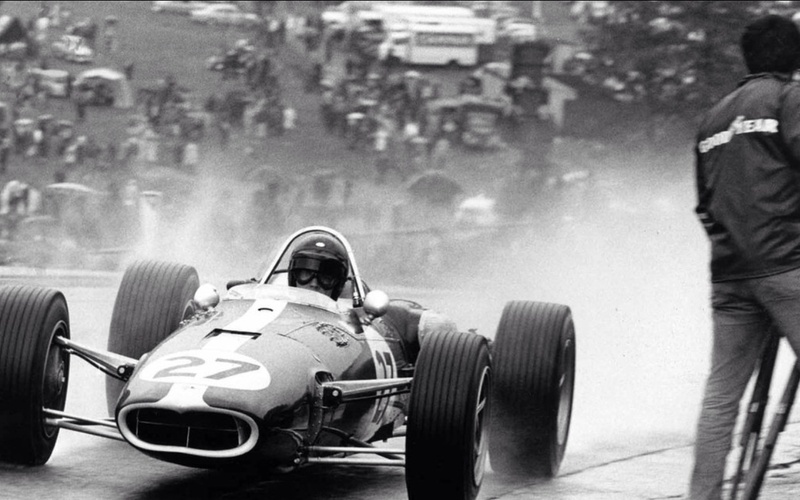 In the re-engined Ford G-W 305 cid powered car Jochen Rindt contested the 1967 Indy 500- he qualified 32nd and retired after completing 108 of the 200 laps with valve trouble- classified 24th. 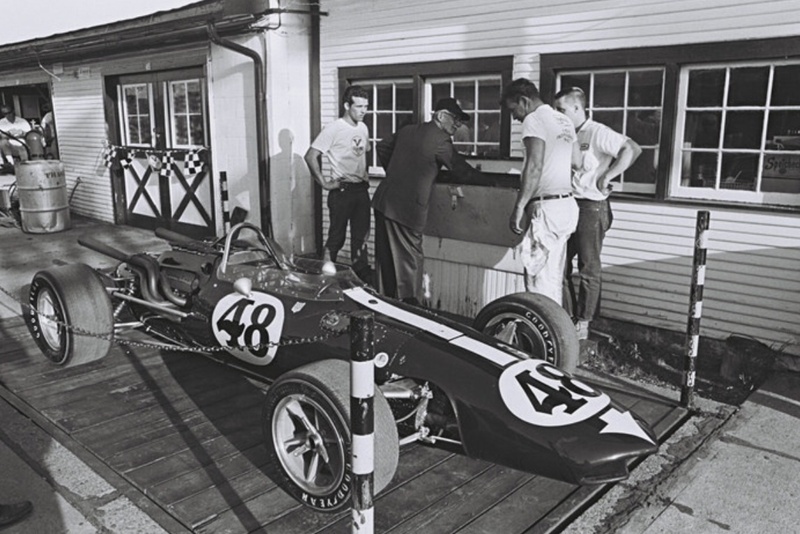 His was the only 305 cid ‘stock block’ powered car in the field, the race won by AJ Foyt Coyote Ford from Al Unser and Joe Leonard in Ford engined Lola and Coyote respectively. Further development work resulted in the ‘Mark 4’ variant which was lighter in weight with narrower rocker covers and an intake manifold inclined towards the engines centreline. 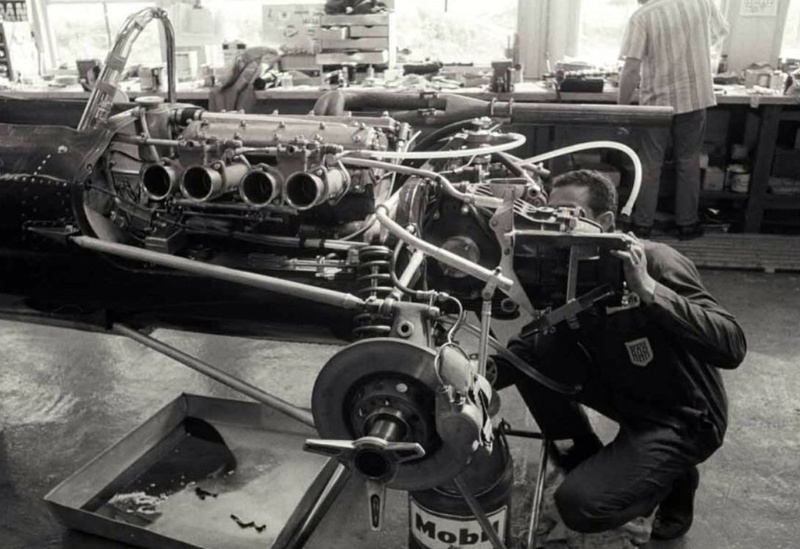 Into 1967 AAR’s Can-Am engine was based on Ford’s new ‘mid-sized’ block stroked to 377cid- Dan’s Lola T70 was often the best of the ‘non-McLaren M6 Chev’ class in a year of dominance from the Kiwi’s with their beautiful papaya cars. Pole at Riverside was a standout. Fitted with a Mark 4 engine, but 318 cid, gave Dan and the G-W engine’s first USAC win in the Rex Mays 300 at Riverside in November 1967. His Eagle Mk3 won from pole from the Bobby Unser Eagle Mk3 Ford ‘Indy’ V8 and Mario Andretti’s Brawner Ford on the challenging 2.6 mile California road course. 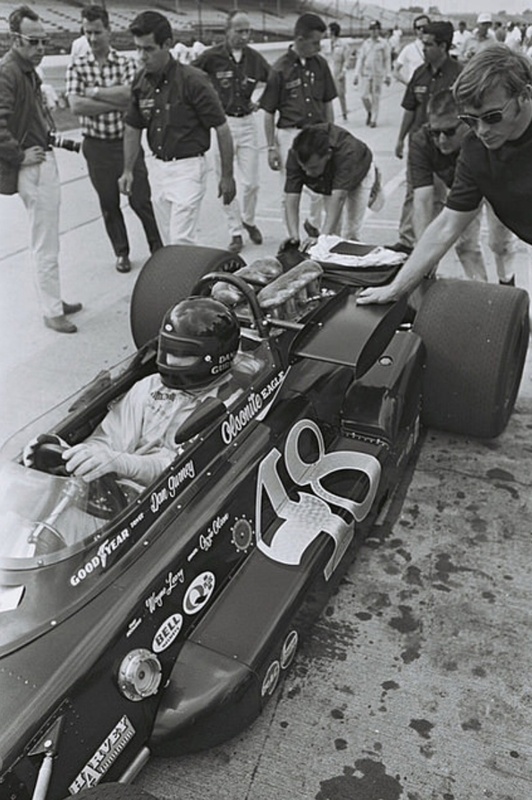 Gurney achieved six more USAC Championship wins over the next two years and finished second twice on the trot at Indy in 1968 in a Mk3 and in 1969 in a Mk7 ‘Santa Ana’. 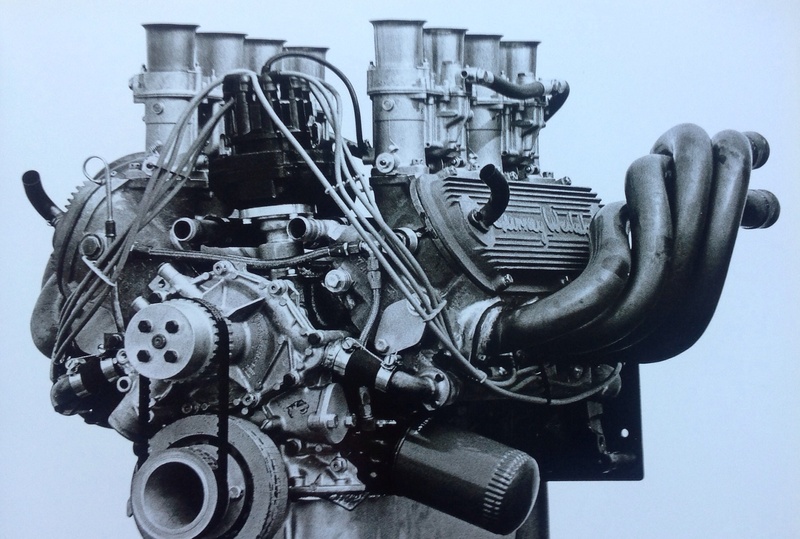 Changes to USAC rules for stock-block engines ultimately allowed the G-W motors to displace 318 cid- on methanol they were good for 560 bhp @ 7500 rpm in 1968 with circa 600 in 1969. On petrol a sprint 289 was good for as much as 506 bhp @ 7800 rpm and a good 305 520 hp. 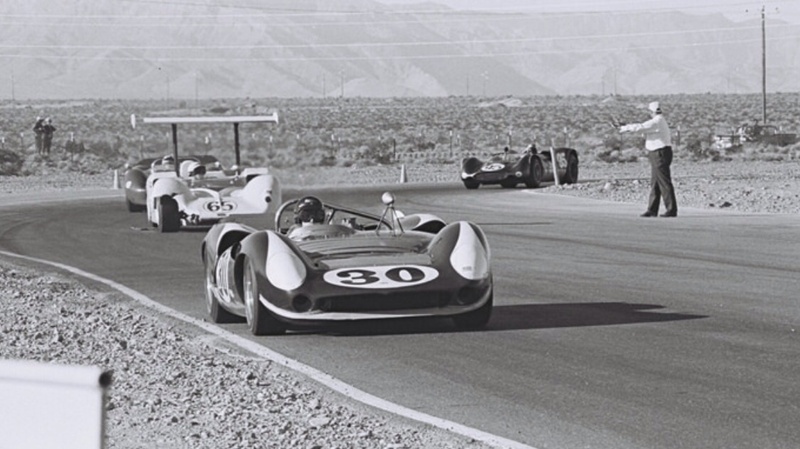 For the 1968 Can-Am AAR acquired a McLaren M6B and in a ‘lightness and dash policy’ took over 100 pounds out of the car by a cocktail of small-block 325 cid Ford G-W and the smaller, lighter Hewland DG300 gearbox. The track dimensions were narrower, the body lighter with a lower, longer nosepiece and suspension arms, exhaust system, gear linkage and bracketry were re-made out of titanium. The car was renamed McLeagle! It wasn’t enough of course, the Bruce and Denny M8A Chev 427 alloy blocked cars rolled over the top of the McLeagle, Lola T160, Ferrari 612P and all else in their path- Denny Can-Am champ that year. 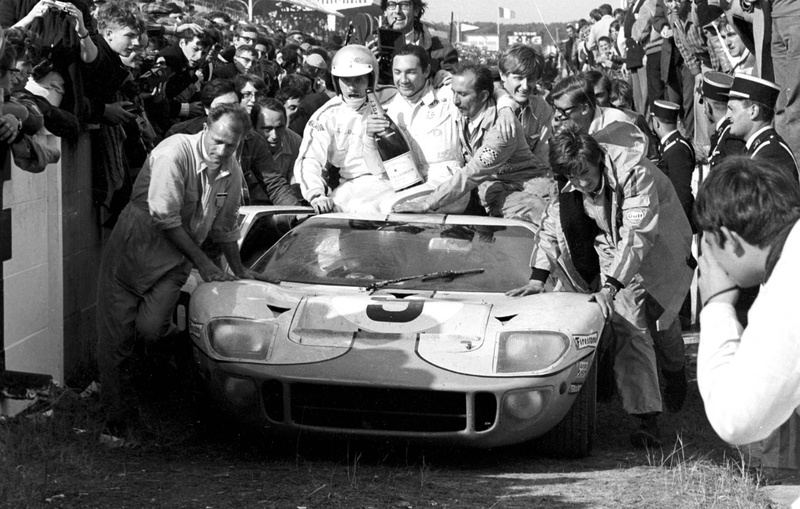 In 1968 and 1969 the John Wyer entered, Gulf sponsored Ford GT40 chassis ‘1075’ won the Le Mans classic fitted with Gurney-Weslake Ford engines. The honours were taken by Pedro Rodriguez and Lucien Bianchi in ’68 and Jacky Ickx and Jackie Oliver in ’69. In 1968/9 despite the Mk1 GT40 hardly being in the full flush of youth the gorgeous, somewhat heavy G-W engined machines won many endurance classics against more modern Porsche, Alfa Romeo, Matra and Ferrari’s (in 1969)- the 1968 Brands Hatch 6 Hour, Monza 1000 Km, Spa 1000 Km, Watkins Glen 6 Hour and 1969 Sebring 12 Hour and Spa 1000 Km. 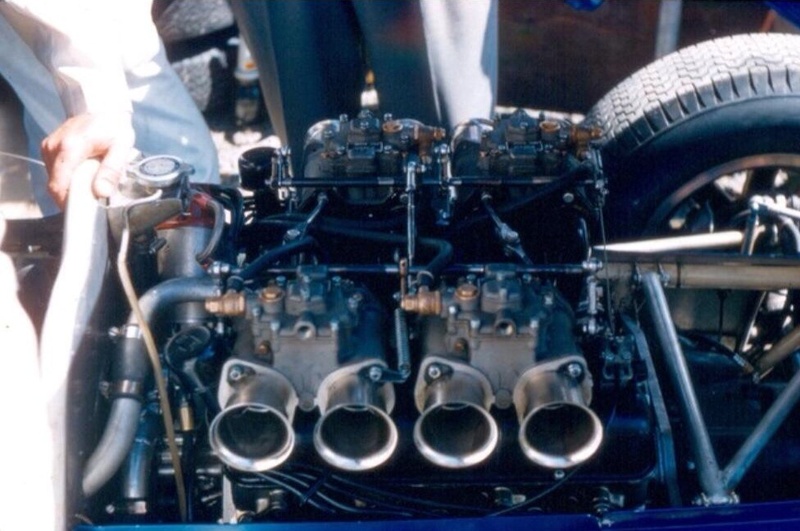 In period the Le Mans winning engines gave circa 440 bhp @ 6800 rpm- that is 302 cid Ford V8, Gurney Weslake heads fed by four Weber 48IDA carbs. 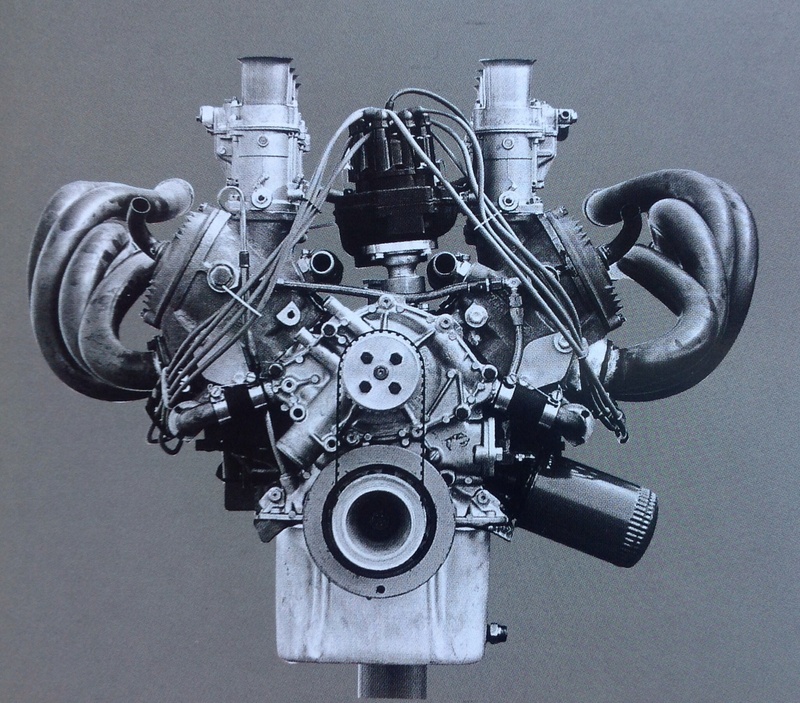 In a busy 1968 for AAR, in a commercial approach to capitalise on the cylinder head designs Gurney started to make modified versions of the heads cast in LM8 aluminium by the Aeroplane and Motor Foundry in England for road cars. The racers Hilborn fuel injection was replaced with a four-barrel carb. Anticipating a large order from Ford, the heads had detuned combustion chambers and were of a budget design. They could be machined with different sized ports and/or valve sizes to the specification of the full racing heads despite some of the internal passageways being of differing sizes to the race heads. When no manufacturer (Ford or Lincoln/Mercury) chose to fit the heads Dan was left with an enormous stockpile of them. ‘It didn’t’ happen because no-one big enough got behind it. If someone like Henry (Ford II) would have said “Hey guys, why don’t you do this?”, that would have been all it would have taken’ offered Gurney. A trial assembly run was arranged by Gar Laux, head of Lincoln-Mercury but perhaps the idea fell foul of the ‘not invented here’ notion. 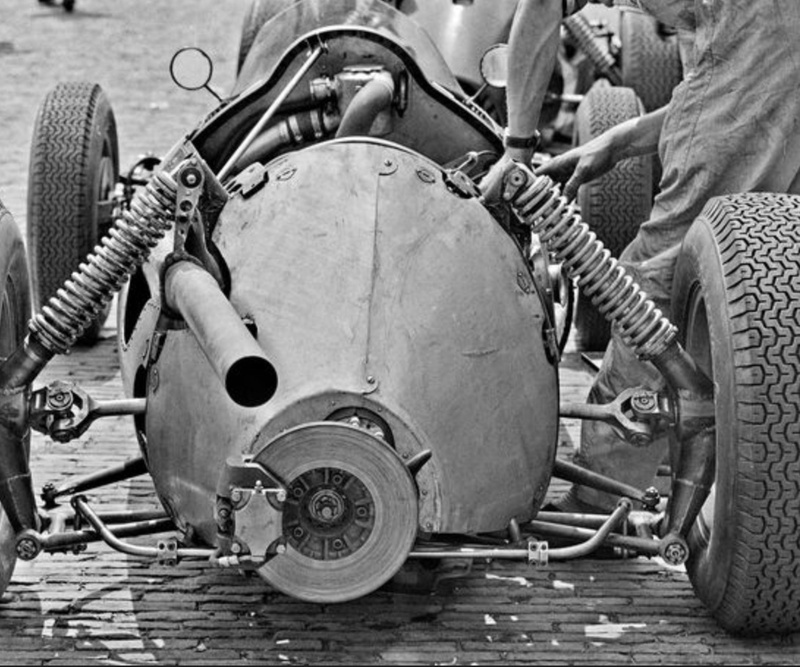 Many of the surplus heads were converted to as near as racing specifications as the Gurney factory could make them and were fitted to Indy cars. None of these heads were fitted ‘in period’ to GT40’s. All GT40 heads were made at the William Mills foundry and were a higher grade casting with the full race combustion chambers, porting and passageways. The Airplane and Motor cast heads were usually branded as Gurney Eagle although some will over time have been retro fitted with Gurney Weslake rocker covers. 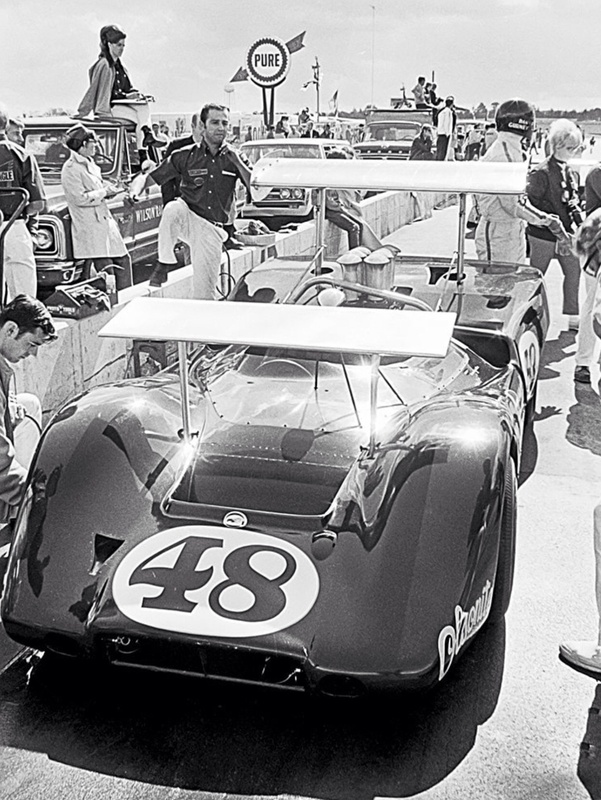 Into the 1969 Can-Am without the Ford factory support he hoped for Dan raced the same McLeagle with a very special, aluminium 344 cid small-block Ford G-W. Some of the Can-Am rounds conflicted with his USAC commitments, back at AAR the team toiled with a three valve G-W variant to sit atop specially cast ally Ford blocks. 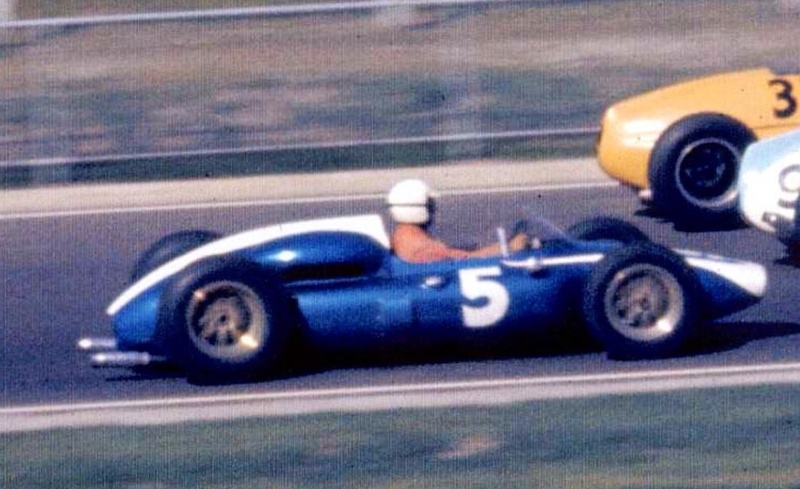 After various development problems kept it off the tracks Dan bought a 7 litre Chev and popped in into the McLeagle, qualifying ninth at Michigan- but tasted a great Can-Am machine when he raced the spare McLaren M8B to third behind Bruce and Denny having started from the rear of the grid. Pete Lyons wrote ‘…from the back…he passed twelve cars on the first lap…Each lap Dan passed fewer cars but he passed them relentlessly. 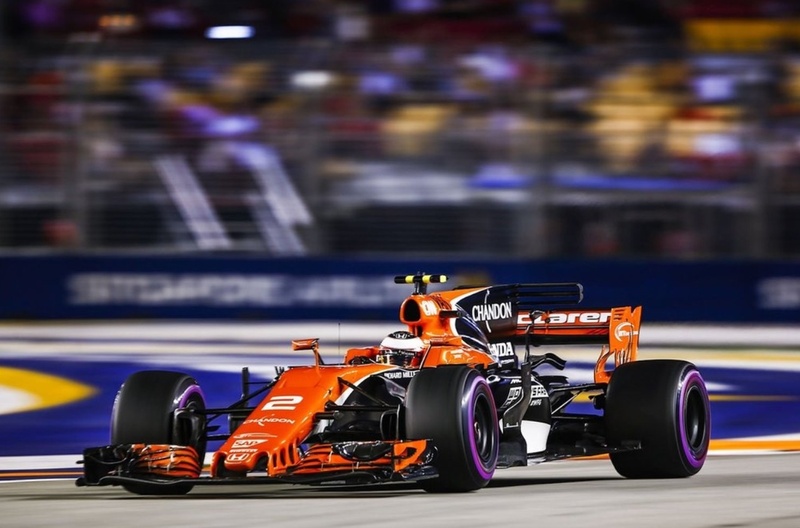 He gave the impression of being careful, feeling out the car, not risking breaking it, yet the big orange gun shot his black helmet along like a cannonball. 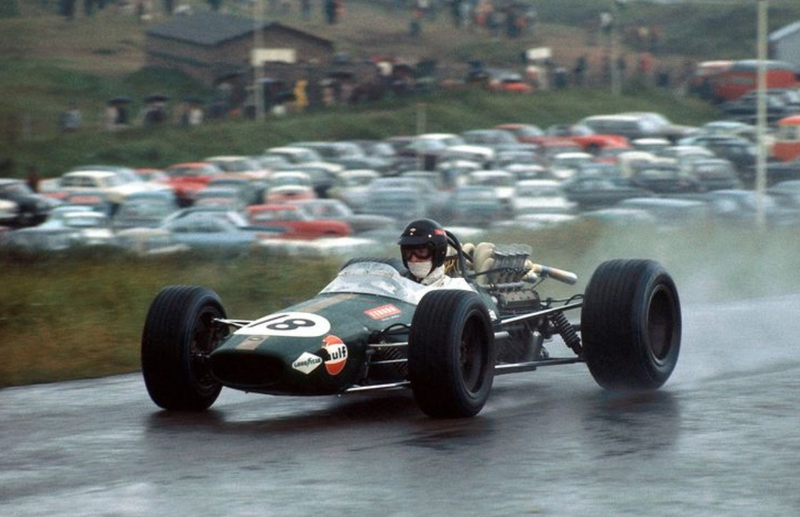 When he caught Brabham, he went by so fast the two could hardly exchange glances…’Jack knew exactly how Dan felt as Brabham tested the same car during qualifying- and did a time in a limited number of laps good enough for row two of the grid! 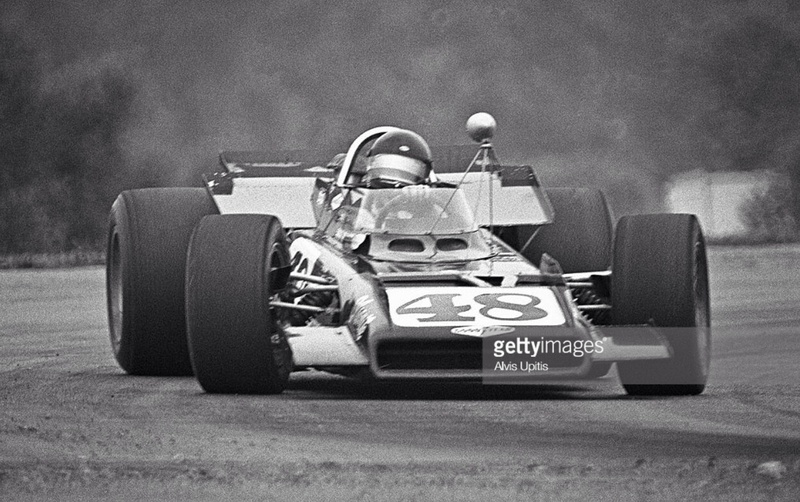 In tragic circumstances, after Bruce’s death at Goodwood, Dan raced a works McLaren M8D Chev with great speed and success until sponsorship conflicts intervened and stopped his campaign short- a great pity as a Hulme/Gurney battle for the 1970 Can-Am title would have been a beauty. It was a fascinating season in the short history of the series inclusive of the Chaparral 2J Chev ‘Sucker’ machine, to have finally seen Dan in a car truly worthy of him would have been something, albeit not G-W Ford powered. Into 1970 the AAR USAC machine, the ‘7000’ designed by Len Terry was both Offenhauser and Ford G-W powered- and achieved its final G-W stock-block win in Swede Savage’s hands at the season ending finale at Phoenix, the 1971 ‘7100’ was designed by Roman Slobodynski was built to suit the Drake Offy turbo-charged four cylinder engine only. Arnold Glass points his ex-works 2.5 litre, four-cylinder Bourne bolide- P48 chassis # ‘482’ down Mount Panorama, Bathurst, Easter 1962. John Ellacott’s beautiful soft browns, blues and blue-greens radiate with the April autumn heat of the Great Dividing Range. 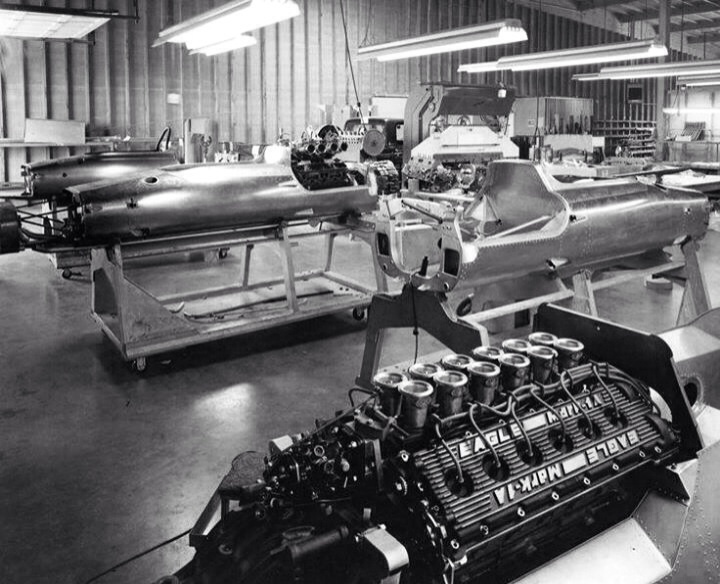 Its just a beaut shot of a car critical in the wonderful pantheon of BRM’s, their first mid-engined design. Arnold’s 1960 P48 is only a hop-step-and jump from Graham Hill’s 1962 World Championship(s) winning 1.5 litre P56 V8 engined BRM P578. 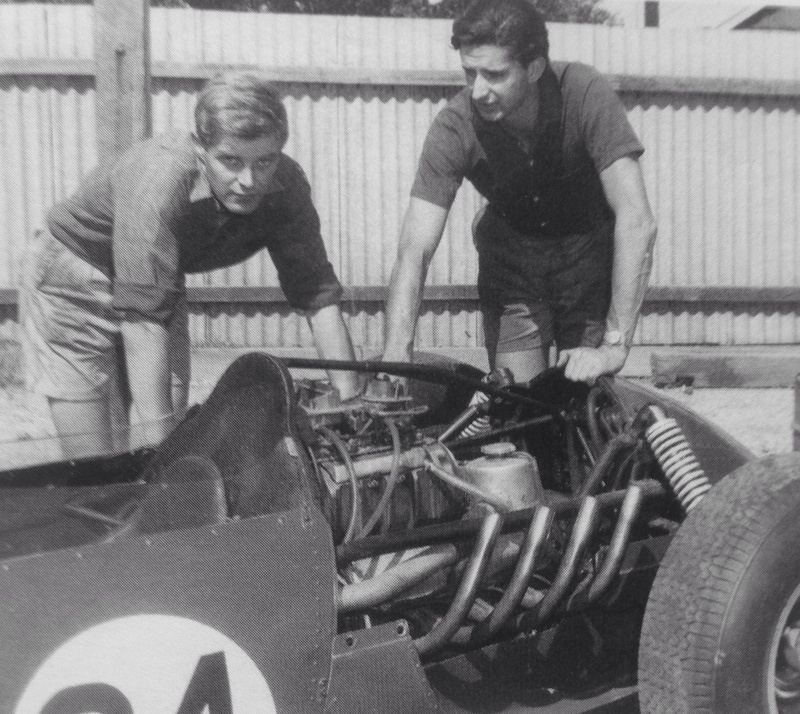 The models in between these two are the 1960/61 P48 Mk2, 1961 Coventry Climax 1.5 FPF powered P57 and two chassis modified to take the P56 V8, the P57 V8. 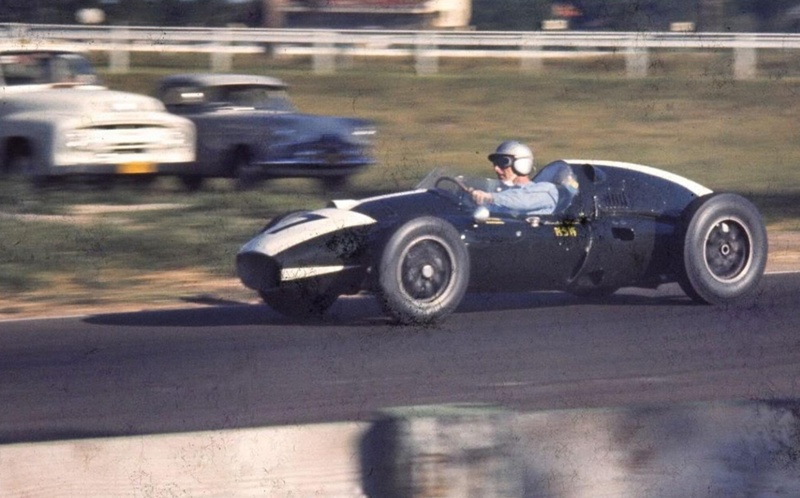 Mr Glass qualified 4th at Bathurst but failed to finish the 26 lap, 100 mile race won by Bib Stillwell from David McKay and Bill Patterson, Bib and David in Cooper T53 Climax 2.5 FPF’s and Bill in a similarly engined T51. I wrote Part 1 of an article about the P48 in mid-2015 promising Part 2 about the cars in Australia shortly thereafter. Here it is, better late than never I guess! The Owen Organisation had plenty of automotive sector subsidiaries in the Southern Hemisphere so it was with great pleasure that Australasian enthusiasts welcomed the visits of the Bourne team to promote the group’s wares from 1961 to 1968. Perhaps that should be from 1954, after all, Ken Wharton raced a howling BRM P15 V16 in the ’54 NZ GP at Ardmore- that race won in stunning circumstances by Stan Jones in Maybach 1 with an amazing race eve engine rebuild which miraculously held together on race day. 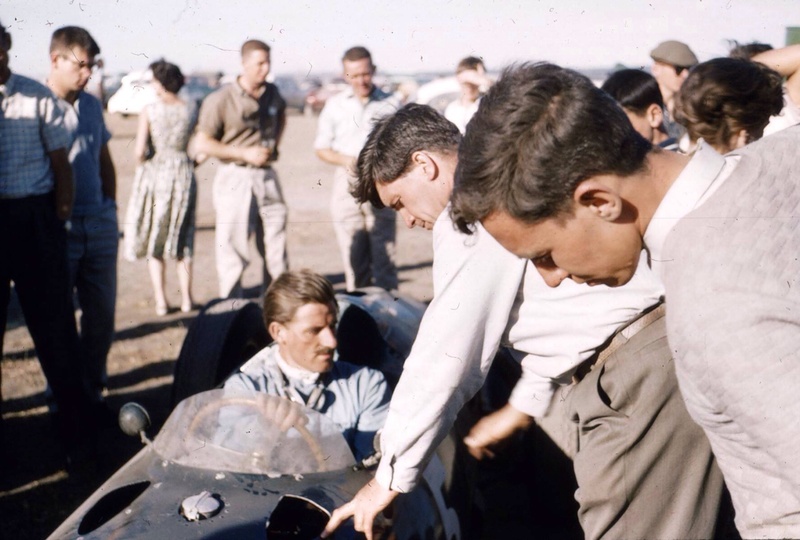 Graham Hill and Dan Gurney didn’t have a great tour with P48’s ‘485’ and ‘486’ in the three races they contested in 1961- the 7 January NZ GP at Ardmore, 29 January Warwick Farm 100 in Sydney and 12 February Victorian Trophy at Ballarat Airfield in Victoria. Still, first and second at Ballarat for Gurney from Hill was a good way to end the tour and the first and only international victory for the P48. By this stage of their development the two early spec P48’s with strut rear suspension and 3 disc brakes- one on each front hub and a single-‘bacon slicer’ disc on the back of the gearbox were competitive in Europea after Tony Rudd was given ‘engineering control’ from the end of the Dutch GP weekend. Lets not forget Graham Hill overtook Jack Brabham and led the British GP at Silverstone before a late race error outed him. 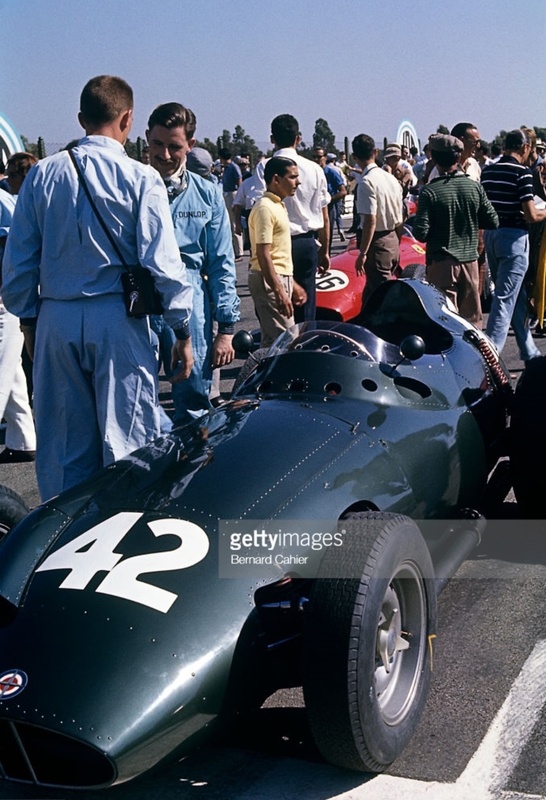 The GP car of 1960 was the Lotus 18 Climax, I’m not at all saying the P48 had the consistent pace of Chapman’s latest, let alone the race-winning speed and reliability of the works Cooper T53’s. 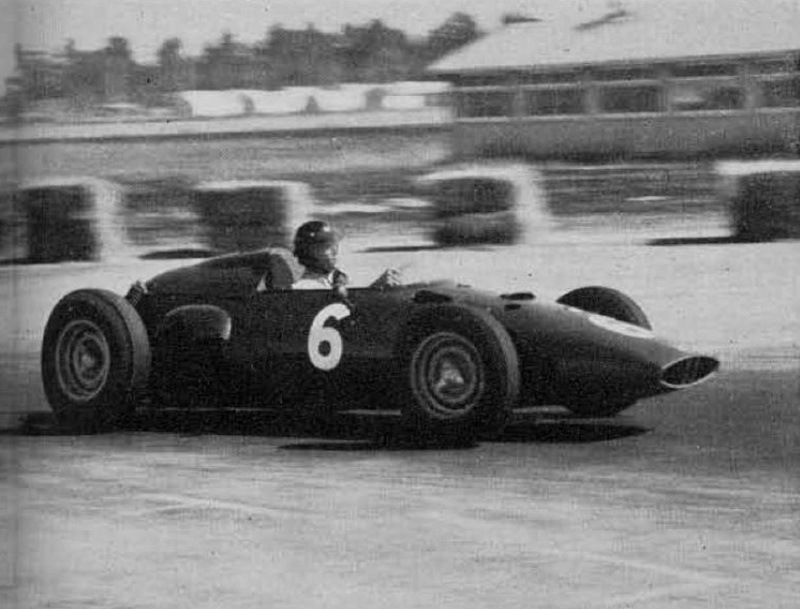 Motor importer/distributor/dealer on the rise, Arnold ‘Trinkets’ Glass had the necessary readies and felt one of the BRM’s would be a more competitive proposition than the ex-Tommy Atkins/Harry Pearce built Cooper T51 Maserati 250S he had been racing. The T51 Maser was an attempt to gain an ‘unfair advantage’ over the Cooper T51 Climaxes, and there was similar thinking in acquiring the P48 powered as it was by an engine regarded as having a little ‘more punch’ than the 2.5 FPF. ‘485’s life in Australia was rather short however. 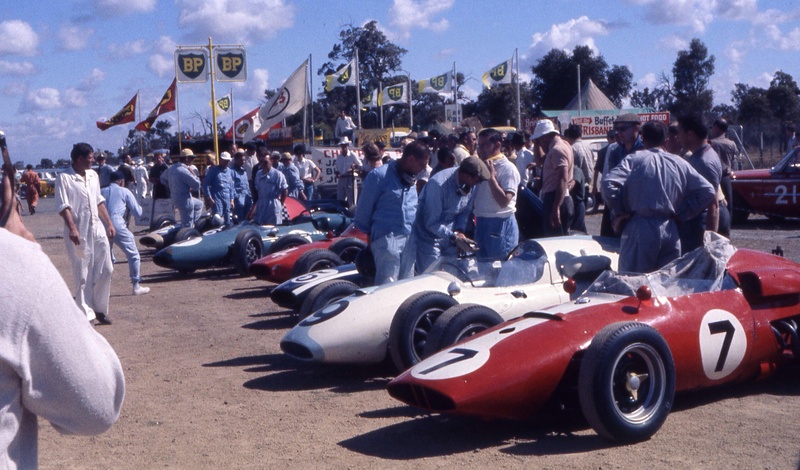 After running the car in Sydney on Warwick Farm’s short circuit Glass travelled to the Mallala, South Australia airfield’s first meeting along with other 1961 AGP aspirants over the 19/20 August weekend to contest the ‘Mallala Trophy’. It wasn’t a Gold Star round but most of the ‘quicks’ made the trip- the AGP was to be held there in early October, Lex Davison the winner in a Cooper T51 Climax. Glass was getting used to the car and circuit like many others. On the Friday morning he set off from the pits, soon lost control of the car badly damaging it. The ‘Australian Motor Sports’ report of the accident records ‘…when Glass braked for Woodroofe, the car spun all over the road and slammed into a tree. The car took it across the engine compartment, and though they attempted a rebuild before the meeting, nothing became of it’. The insured car was soon on a ship back to the UK where the Bourne team assessed the chassis as being beyond economic repair so it was scrapped. Chassis ‘482’ was sitting unused ‘in stock’ and so was despatched to Australia ‘without engine or gearbox so I can fit my spare engine and gearbox from the crashed car’ as the replacement. It was the first of six ‘production’ first series, strut rear suspension/3 brake P48’s and used the front-end structure cannibalised from the broken up front engine BRM Type 25- chassis ‘257’. 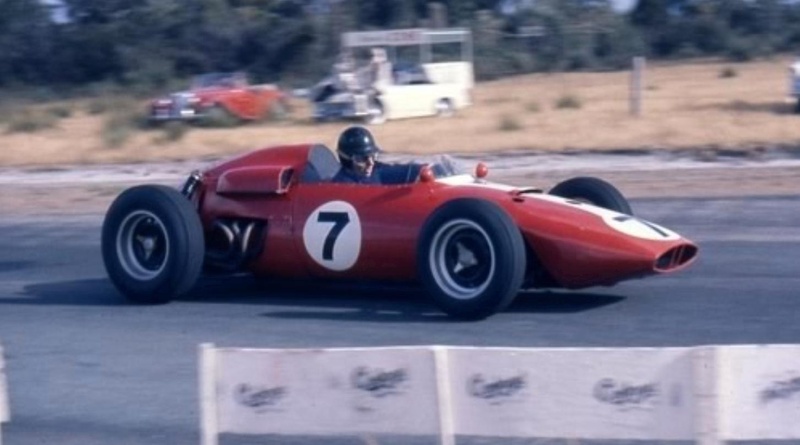 Arnold raced it with both the 2497 cc, 4 cylinder, DOHC BRM engine as fitted above at Bathurst and later the ex-Chuck Daigh Scarab RE, 3.9 litre, aluminium Buick V8- that engine sold to Glass after the Scarab’s one race only, the Sandown Park International in March 1962. 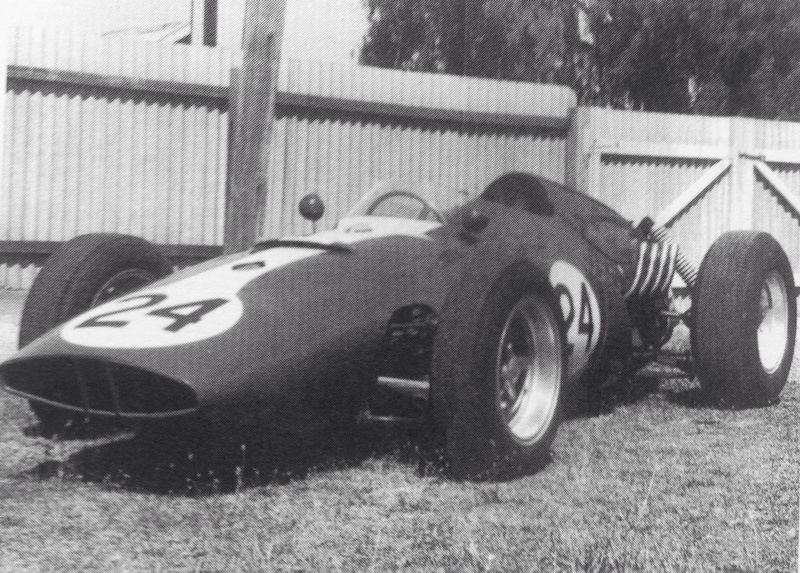 Glass raced the Cooper Maserati whilst he was BRM less at Warwick Farm, Bathurst, and Mallala for the AGP. 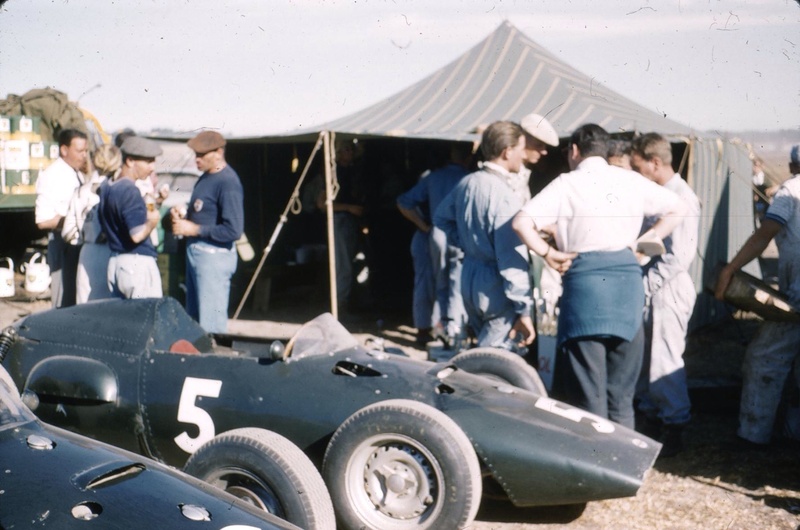 BRM ‘482’ arrived in time for the season ending Hordern Trophy at Warwick Farm on 5 November, there he retired with fuel-pump failure in the race won by Stillwell’s Cooper T53 with Bill Patterson winning the Gold Star that year in his T51 Climax. The very successful Datsun motor dealer/distributor/importer raced ‘482’ throughout 1962. He contested the NZ GP at Ardmore but could not see in the streaming rain having been well placed early, retiring the car with a slipping clutch. At Wigram he was 8th. Back home at Warwick Farm, for the 100 he retired from overheating after blowing a radiator hose. He was 4th at Lakeside on 10 February and DNF after a spin in the Lakeside International championship round the following day. At Longford in March he was 3rd in the preliminary and ran 6th in the feature race but retired with falling oil pressure but not before being timed at 167 mph on ‘The Flying Mile’. Arnold didn’t race the car at the Sandown International, the circuit’s opening meeting, but clearly was impressed by the ‘mumbo’ of the Buick V8- Chuck Daigh was 4th in the only ever race for the mid-engined Scarab RE. A very great shame that, it would have been interesting to have seen the car contest the Intercontinental Formula races for which it was designed. By that stage the lease deal with Rubery Owen was at an end so Arnold did a deal with them and Australian Customs to acquire the car at a price- and pay duty at an amount which made sense all around. At the Bathurst Gold Star round (pic at this articles very outset) he had suspension problems- an attachment to the rear upright was half broken through on the left rear suspension. 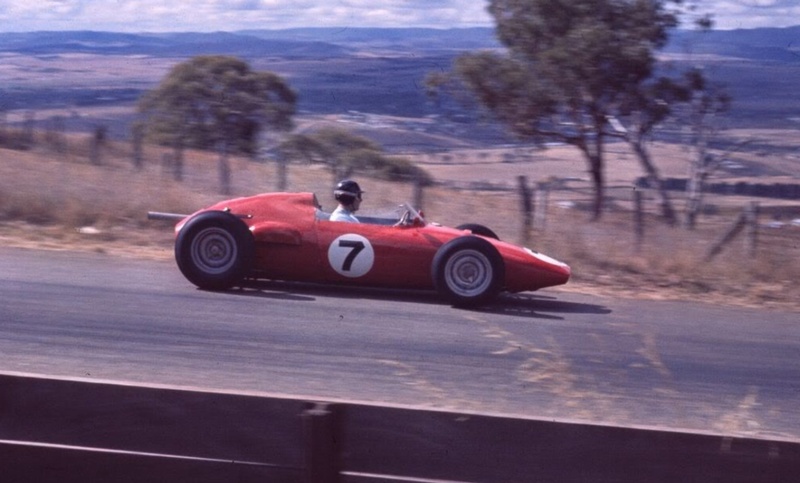 In May he raced the car at Catalina Park in the New South Wales Blue Mountains and had a good battle with David McKay’s Cooper T53 Climax- so good a match race between the pair was staged at the Warwick Farm meeting in early June- Glass led before gear selection difficulties intervened, giving McKay the win. He missed the Queensland, Lowood Gold Star round in June, reappearing with the Buick V8 installed at Catalina on 5 August- the Buick’s torque was too much for the cars clutch. 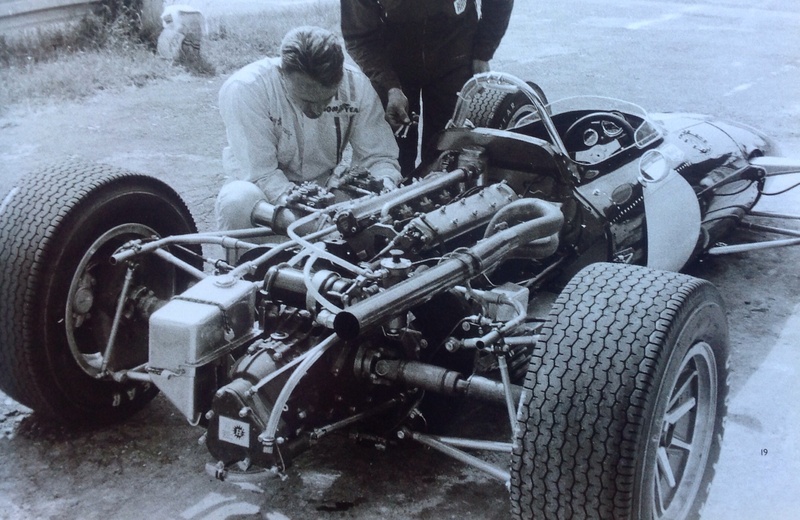 The engine installation work, inclusive of creating a bellhousing to mate the American V8 to the P27 BRM transaxle was done by racer/engineer John McMillan and mechanic/engineer Glenn Abbey. 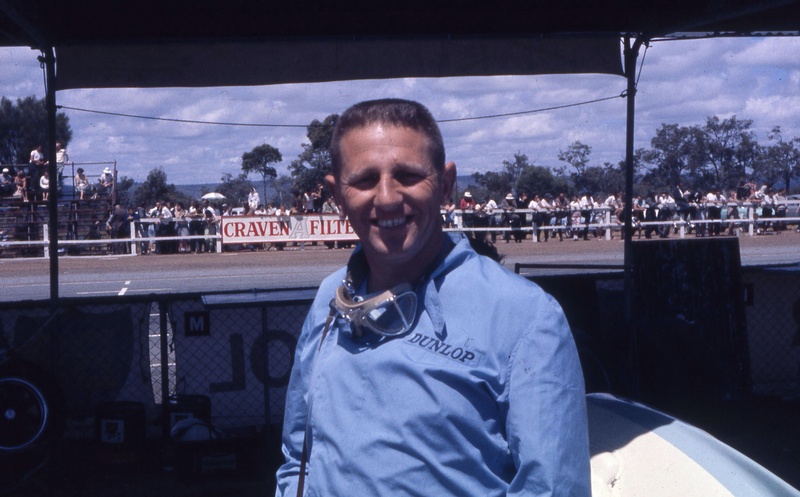 Later in August he had more success in the Blue Mountains with a second and third behind David McKay and Chris Amon respectively. At the Hordern Trophy at Warwick Farm Glass was 5th before pointing his equipe in the direction of Perth, 3940 Km to the west, for the Australian Grand Prix. The BRM Buick was 4 seconds off the pace of McLaren’s pole to give some semblance of relative speed of the 1960 chassis BRM 3.9 pushrod ohv V8 with the very latest 1962 T62 chassis Cooper 2.7 FPF dohc motor. 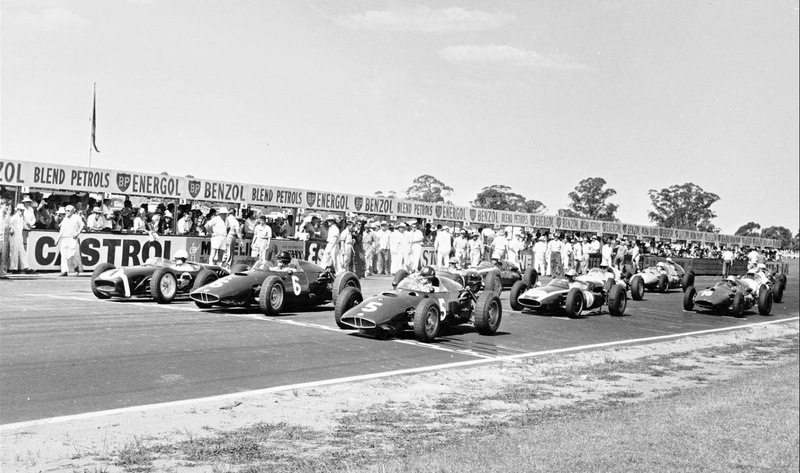 Remember that Australasian elite single-seater racing was contested to Formula Libre until the Tasman 2.5 Formula was adopted from 1 January 1964. 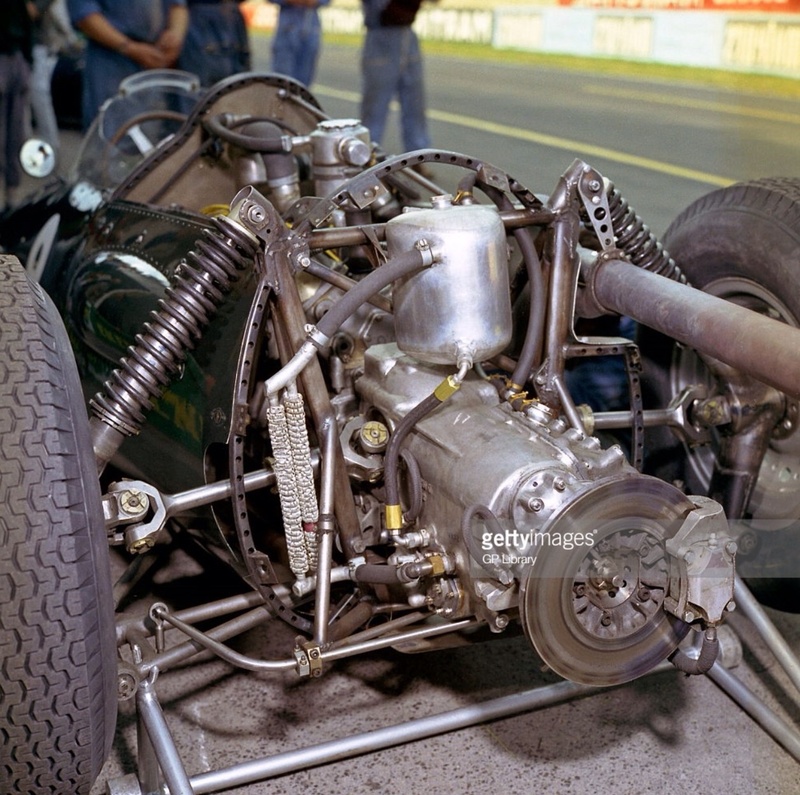 Glass’s aluminium V8 engined BRM was a very clever ‘F5000’ in 1962! 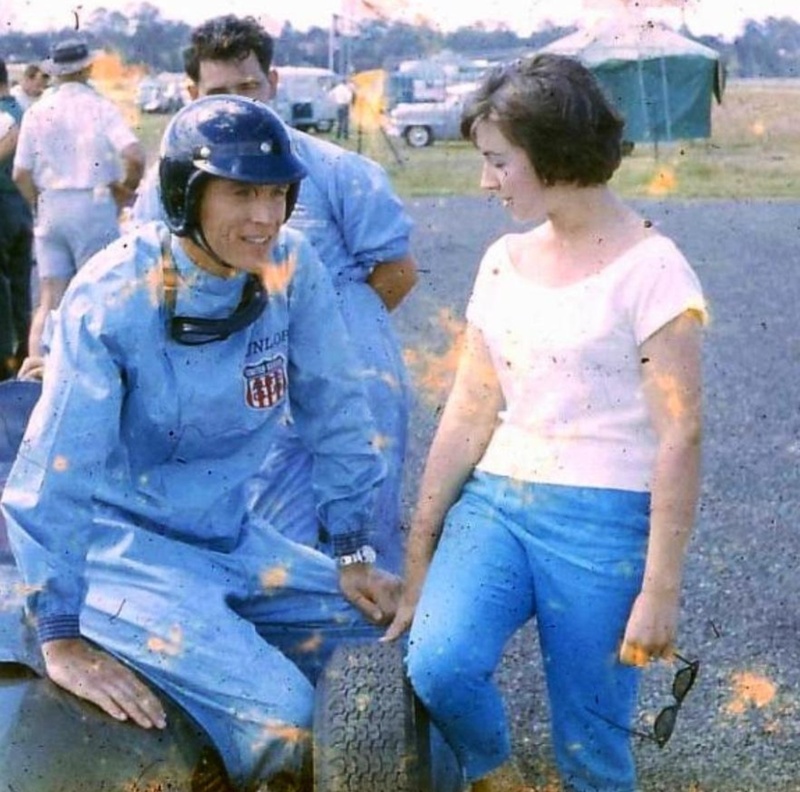 Glass shipped the car to New Zealand for the 1963 Internationals but he was unable to drive after a water skiing accident so lent it to Kiwi Ross Jensen to race at Pukekohe in early February. Talented Jensen won a preliminary and the ten lap feature race. 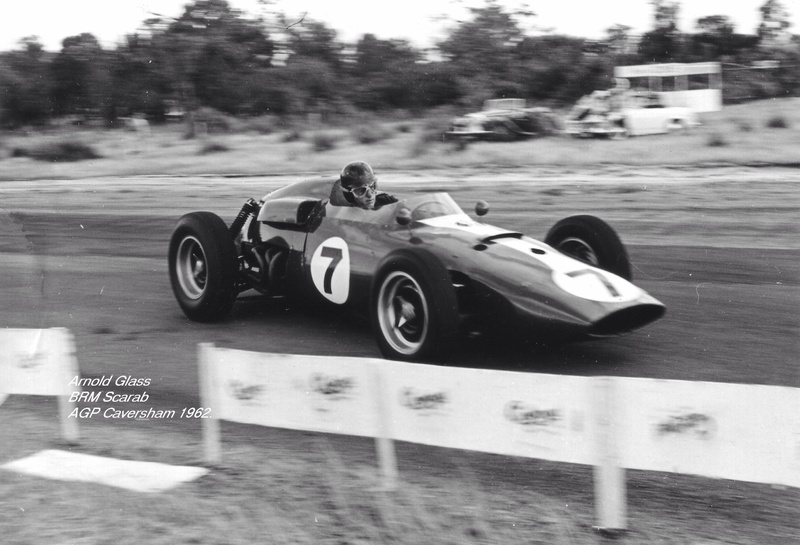 Nye records that Jack Brabham tested the car briefly at Levin. It would have been the only other P48 he drove since testing the prototype car ‘481’ at Goodwood in late 1959. The car was advertised in June/July 1963 and bought by South Australians Jo Steele and John Allison. 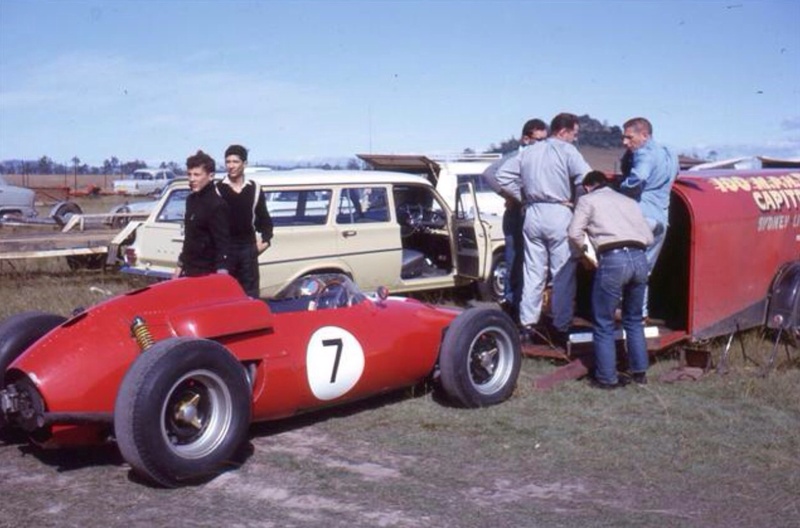 The ‘Scarab’ Buick V8 went to Bib Stillwell for his Cooper Monaco as an FPF replacement and an engine went to Don Fraser who fitted it to his Cooper ‘Lowline’ and later into one of the Cicadas he built with Doug Trengove. This car was raced in Gold Star events into 1970. Another engine slated for a speedboat powered a Speedcar raced by John Hughes. Both engines found their way to the UK- the Fraser engine and ‘box to Tom Wheatcroft and John Hughes engine to Robs Lamplough. Steele, an engineer who later worked for Firestone in the UK and Allison, a Castrol employee fitted the P48 with a Ford 260 cid V8 which was dry-sumped and then had bolted to it a GM4-71 supercharger. The car was modified further but only in that the cars rear wheels, 6 inches wide were fitted to the front and the fronts widened to 8 inches were fitted at the rear. A simple aluminium casting was made to mate Ford V8 engine to BRM P27 gearbox. 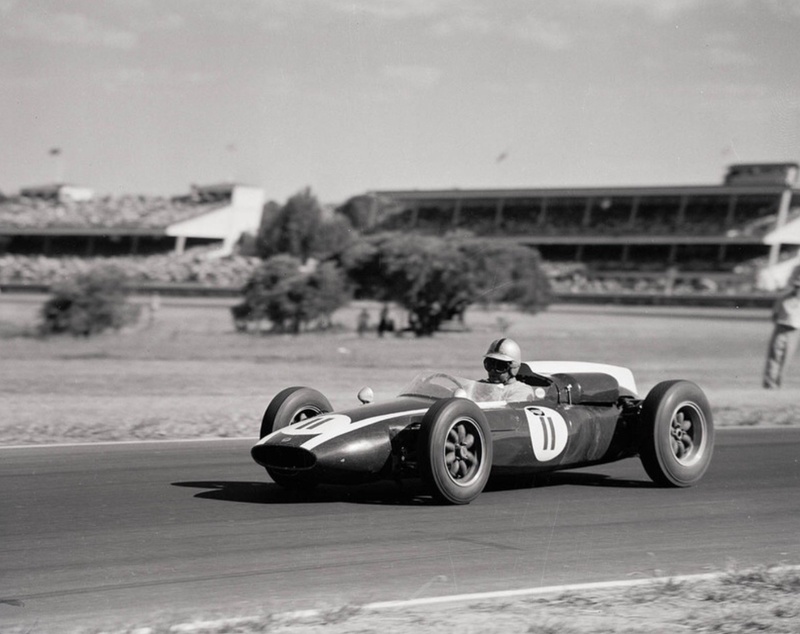 In this form, on 30 March 1964 the BRM ‘482’ Ford V8 made its debut at the scene of ‘485’s demise- Mallala! They raced it throughout 1964 at Mallala in June, October and December, a highlight was finishing in 4th in the South Australian Road Racing Championship in June. 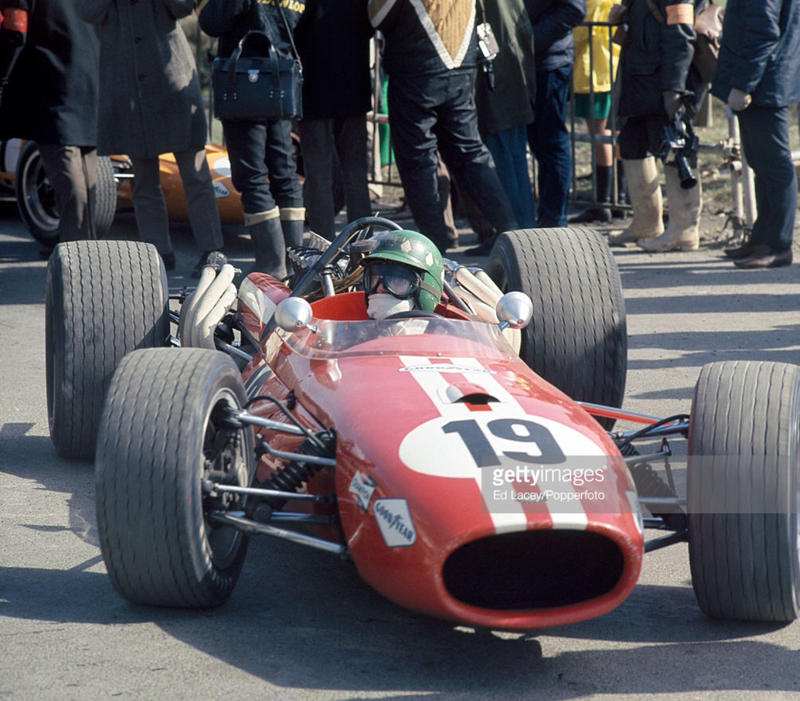 In June/July 1965 the two South Aussies took the car to the UK where Steele had organised a transfer via Castrol. In the UK they stiffened the chassis and lengthened the wheelbase by four inches in the front chassis bay. Allison sold his share in the car to Steele who raced in Libre events at Mallory, Snetterton and Silverstone before selling it. A couple of owners later it was advertised in an August 1971 issue of Autosport, the purchaser, Tom Wheatcroft. In a ‘back to birth’ conversion the chassis’s P25 bits and bobs were stripped and used in the Donington Collection’s three car run of P25’s. The remains of the car- chassis, body, wheels, block, shocks and some suspension bits were sold to Anthony Mayman via a Brooks auction. He engaged Hall & Fowler to restore/create a P25 from the bits, in 2003 the P25 and chassis of good ‘ole ‘482’ were owned by Bruce McCaw in the US. The mid-engined revolution was in full swing throughout 1958/9, the full extent of the rout obvious once Coventry Climax built a new block for the FPF to alow John Cooper to compete at the class capacity limit of 2.5 litres. 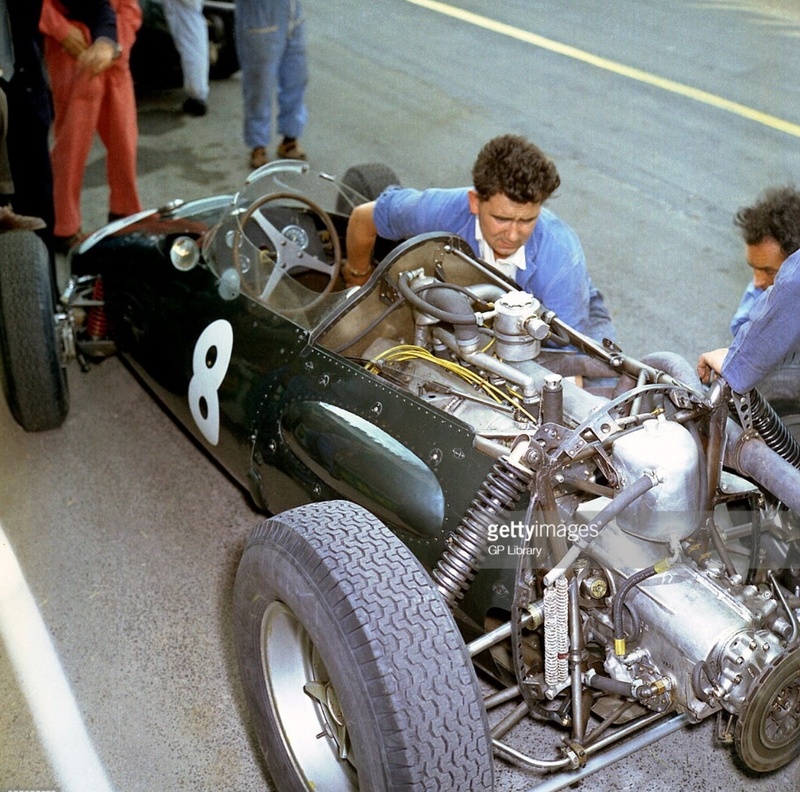 BRM responded by building a mid-engined parts bin special, what Bruce McLaren called a ‘whoosh-bonk’ car using many existing off the shelf components, namely the P25’s engine, transmission, brakes and other componentry which was assembled into a simple multi-tubular spaceframe chassis. Alfred Owen approved Peter Berthon’s request to build such a car after Bonnier’s P25 Zandvoort win in 1959 whereupon Berthon briefed senior draftsman Aubrey Woods to set down layouts for the frame and suspension. 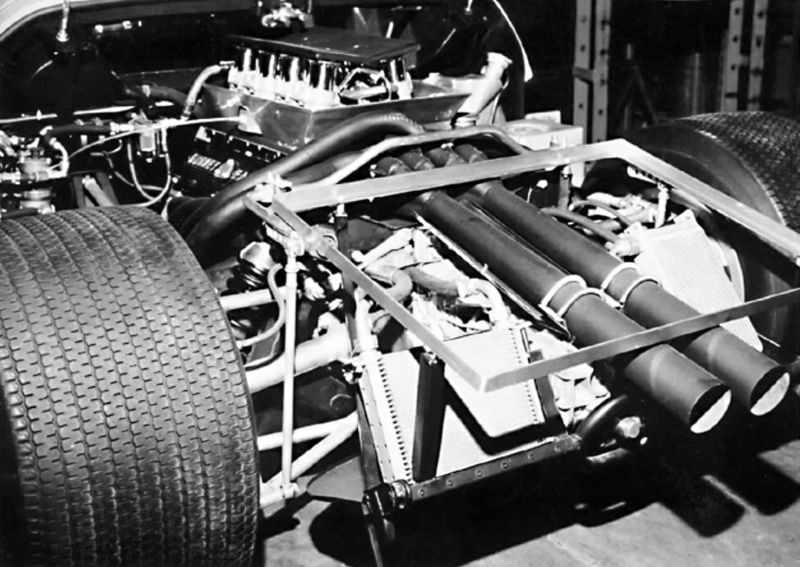 The P25 engine had to be modified to fit the rear of a chassis with its magnetos being driven by belts instead of the crank gears. 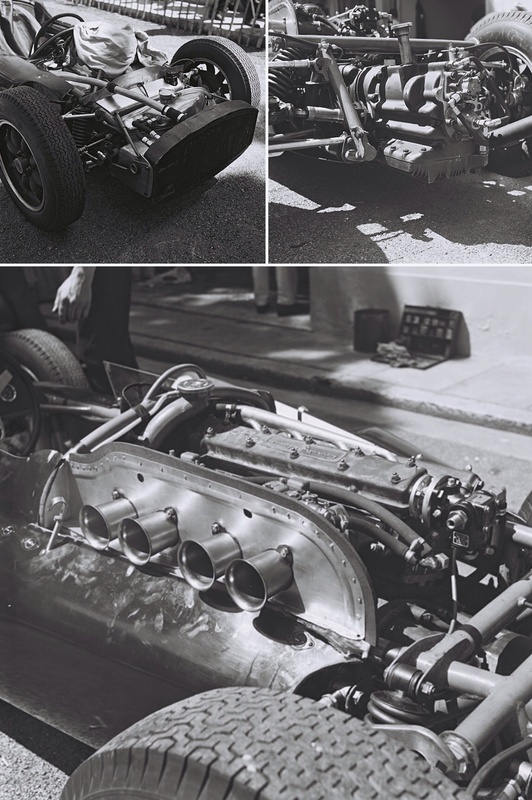 The P25 cars BRM P27 four-speed gearbox, complete with single ‘bacon-slicer’ disc brake then bolted onto the rear of the engine via a new bellhousing designed fit for purpose. MacPherson Strut suspension was used at the rear and P25 ‘256’ dismantled to provide parts inclusive of its frame- the front section of which was hacked off and welded on to ‘481’s otherwise new frame. 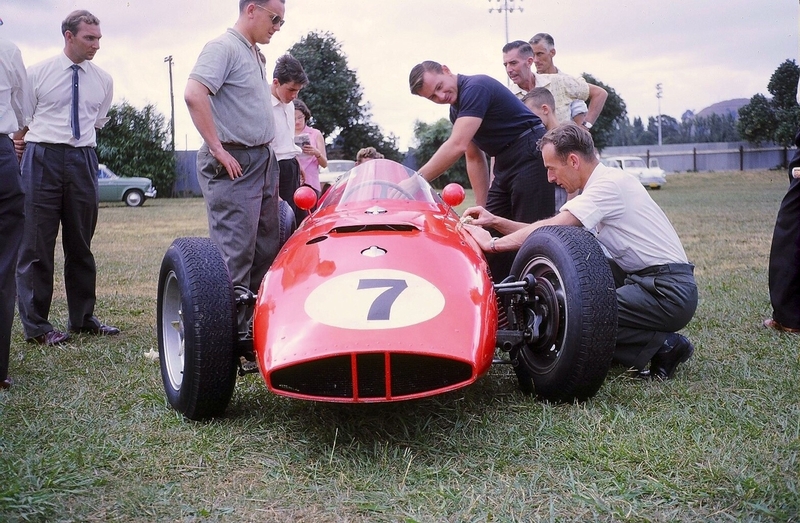 The result was ‘flexible’ but ready, shaken down at Folkingham by Ron Flockhart it travelled to Monza for the ’59 Italian GP weekend. 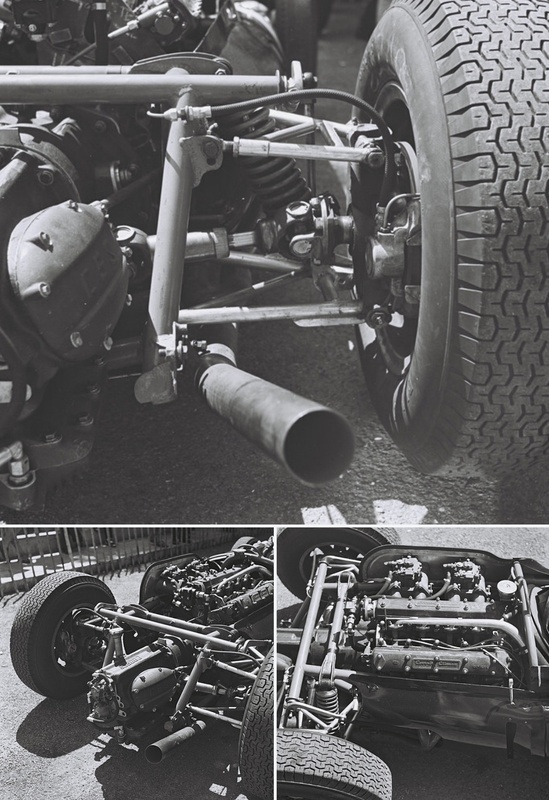 The shortcomings of ‘481’s frame were addressed back at base by adding fillet tubes into the main frame intersections and some tubes were relocated to reduce their unsupported runs through the frame sides. These mods added 4 lbs in weight but stiffened the frame from around 850 lbs/ft/degree to 1800 lbs/ft/degree. These improvements were built into the ‘production’ frames which followed. When the prototype ‘481’ was continuously tested the mid-engined car was tested back-to-back with P25’s to get baseline times with a car which by then was equal to the best of the ‘old paradigm ‘ front-engine designs. 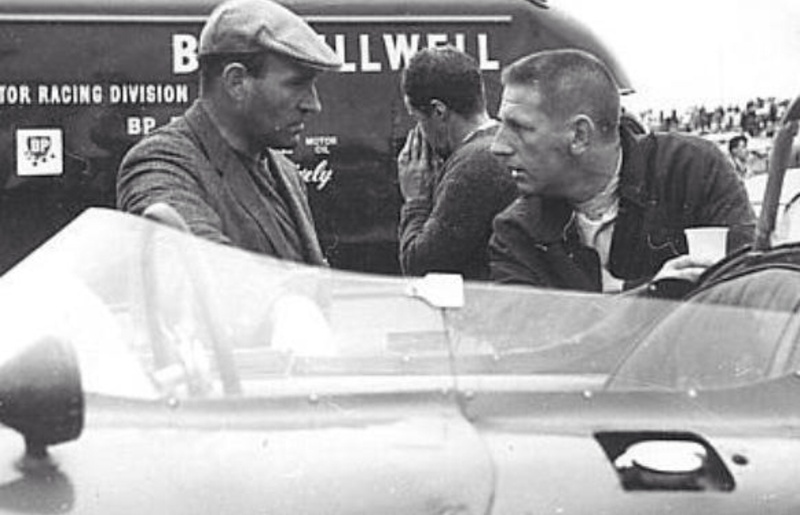 Sir Alfred Owen ultimately determined the direction Bourne was to take by letter on 17 November 1959 in which he said all of the cars the team raced in 1960 would be mid-engined. The exception proved to be the first round in Argentina with Jo Bonnier finishing 4th and Graham Hill DNF with overheating- the cars proved their pace by qualifying 4th and 3rd. At the time of Owen’s edict six chassis were laid down in Stan Hope’s build-shop and all of the P25’s, with the exception of Bonnier’s ’59 Zandvoort winning chassis, were stripped of their mechanical elements to build up the P48’s for the final year of the wonderful 2.5 litre formula. ‘481’ long testing program ended when it was finally put aside when ‘482’ first ran on 23 March 1960 at Goodwood- there Jo Bonnier and Dan Gurney joined the test team for the first time- to this point the continuous winter testing program had been carried out by Ron Flockhart and Graham Hill. The P48 was a simple, sparse, lightweight spaceframe chassis with P25 double wishbone front suspension and MacPherson or was that Chapman(!?) Strut rear suspension with each strut located by a single lateral lower wishbone and a single radius rod, anchored forward on the chassis frame. The frame at the rear was high to provide top spring/damper mounts for each strut. The chassis used 1.5 inch 17 swg tube bottom rails and 1.25 inch 17 swg top rails and diagonals in the side bays. The beautiful body was made inhouse of course, of magnesium alloy and fully detachable. Steering was P25 rack and pinion. By this stage the all alloy 2497cc (102.87X74.93mm bore/stroke) gear driven DOHC, 2 valve, Lucas magneto sparked, dual Weber 58 DCOE carbed engine developed about 272 bhp @ 8,500 rpm and 210 lb.ft of torque at 6,000 rpm. The BRM Type P27 4 speed gearbox was also used complete with the ‘box mounted single rear disc brake. What had worked acceptably on the front-engined P25 was not so effective on the P48 with so much of the cars mass now disposed at the rear of the car. 10 1/2 inch disc brakes and forged alloy wheels were by traditional supplier Dunlop, as of course were the tyres- 5.50-15 inch front and 7.00-15 inch rears. 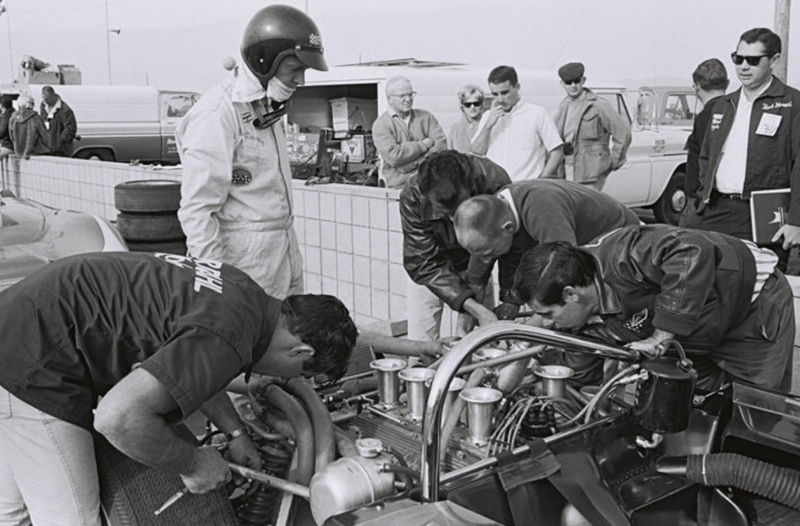 By the time the season started an enormous amount of testing had been done at a variety of circuits with a chassis setup which most of the drivers agreed was good. 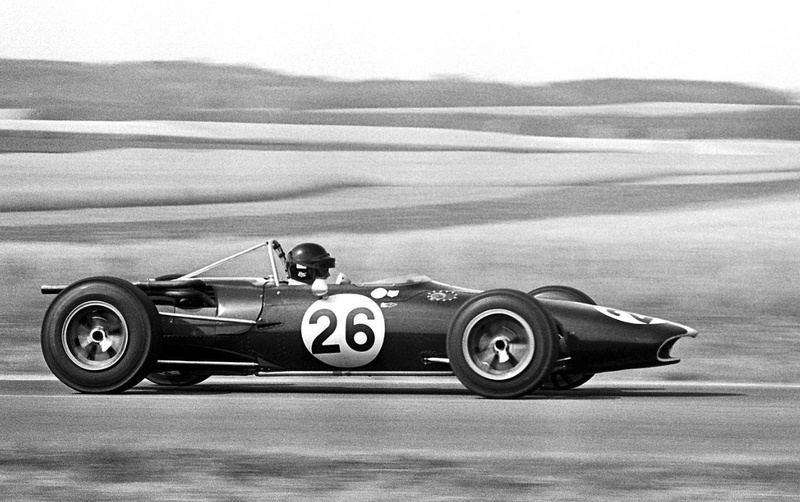 The game-changer however, was Chapman’s multi-category Lotus 18 which was simply ‘the car of 1960’- Cooper won the title again that year with their T53 Climax ‘Lowline’ but it was more about reliability than sheer speed. Not that reliability isn’t a valuable commodity, mind you. The pace of the Lotus was apparent from the first race of the season, the non-championship Glover Trophy at Goodwood in May. Innes Ireland won the event with Gurney and Hill Q7 and Q9 for DNF crash and 5th- the hopes of pre-season testing were blown away by the pace of both the new Cooper T53 and especially the Lotus 18- its weak point the ‘Queerbox’ Lotus sequential transmission. A test session at Snetterton where Tony Rudd fitted a range of rear anti-roll bars transformed the handling of the car- such fitment was made without his boss, Peter Berthon’s knowledge. The season started poorly with a whole raft of mechanical and engineering problems including handling, brakes, clutch, engine, cracked and breaking rear hub assemblies which all came to a head at the Dutch Grand Prix weekend, or more specifically a meeting at the Bouwes Hotel at Zandvoort on the Sunday night. The meeting was attended by Sir Alfred Owen, his sister Jean and her husband Louis Stanley and drivers Bonnier, Gurney and Hill. Gurney killed a spectator watching from a restricted area after brake failure so emotions were running high. 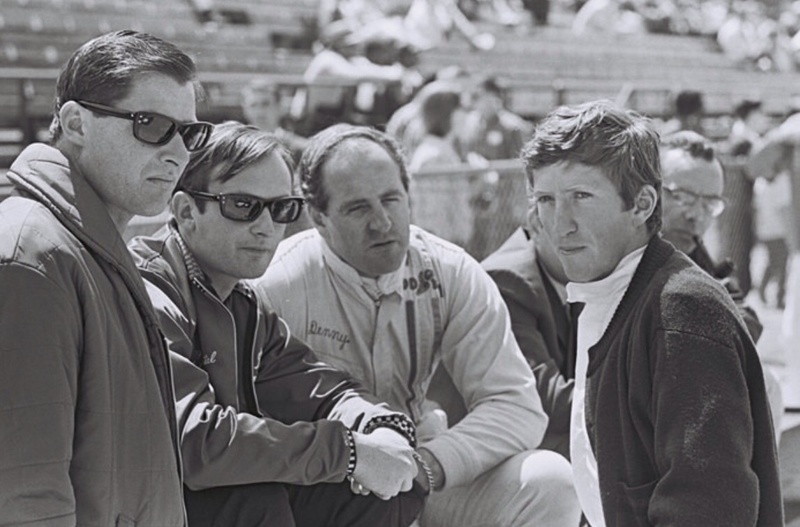 During this epiphany, the drivers, especially Dan Gurney and Graham Hill expressed complete disatisfaction in the way the team was managed and run particularly the old-stagers and team founders Raymond Mays and Peter Berthon who it was felt were completely out of touch with the ways of modern racing and team management. Graham Hill pressed the case of Berthon’s assistant Tony Rudd to both manage the engineering and changes to the team’s cars at meetings as well as lead the design and engineering of the cars going forward. Sir Alfred Owen, after much discussion, including listening to the contributions of Mays and Berthon who joined the discussion after attending another meeting about start money, in essence agreed with and made the changes advocated by the drivers albeit Mays remained Race Director responsible for driver contracts and the like and Berthon was to continue as Chief Engineer. Rudd was empowered to make changes to both the existing P48’s suspension set-up which gave immediate speed and predictability. He started the build of the P48 Mk2- a four wheel disc, wishbones all around, lower chassis car in a corner of the workshop to test his theories of the shortcomings of the current P48 cars chassis and suspension design and geometry. Owens decisions were defining and seminal in terms of the next decades successes and adventures under Tony Rudd’s brilliant leadership. H16 ‘engineering hubris’ and its consequent loss of engineering direction duly noted! Before the Spa weekend new rear hubs and front wishbones were designed and built for each of the drivers existing P48’s. 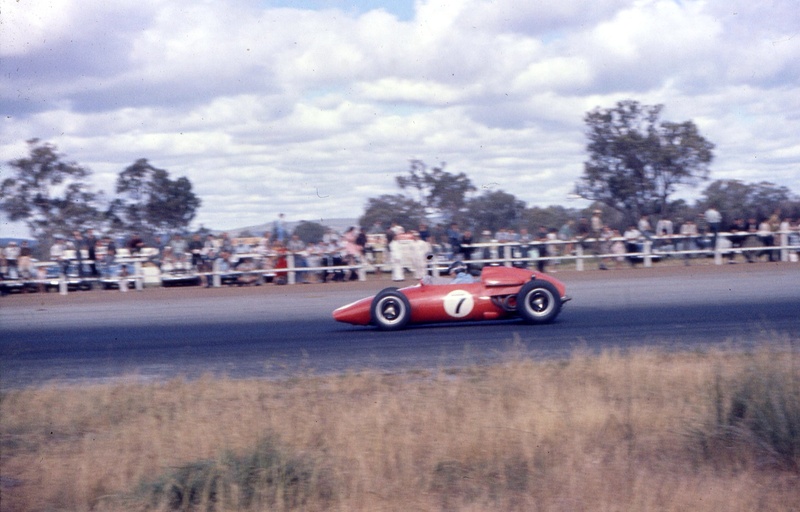 The result was immediate-Hill went like a jet in the race and was pulling in race leader Jack Brabham until he experienced a major engine failure which carved the block in half, ruining a great run. BRM had three drivers that season- Jo Bonnier, Dan Gurney and Graham Hill, in that order of perceived seniority at the seasons outset. It soon became clear that GH was the fastest, the best test pilot and a driver with mechanical sympathy. Bonnier generally qualified better than Dan and finished more often whereas Gurney had a shocker of a season with the car constantly failing under him with a myriad of problems- including the brake failure at Zandvoort. The reality is that Gurney had limited opportunity to display his pace, evident at Oporto for example because the car failed under him so often. Gurney was off to Porsche as fast as he could run- it was easily his worst season in F1, and his own Eagle Weslake adventures were not without challenge. Graham was very much on the upward curve, Bonniers speed, was then better than I had anticipated before researching the season, but he had peaked in reality at GP level. ‘Before I joined BRM I had served only one season in F1 with Ferrari, and it is obvious now that in my inexperience I’d really had no idea of just how rugged and durable the Ferrari (Dino 246) was’. 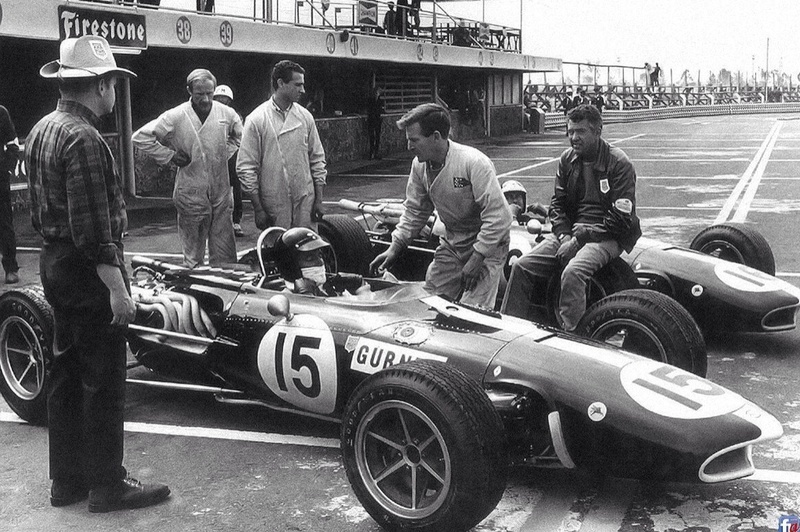 ‘Even with all the tenderness you could summon up, it never seemed quite enough to bring the BRM right through a race. 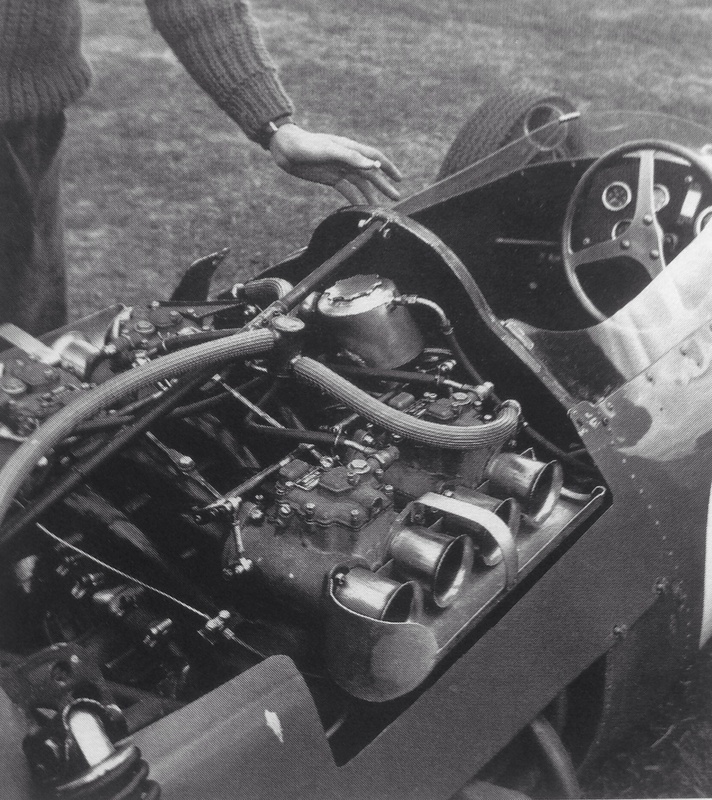 Even so the BRM engine had a fatter mid-range than the Ferrari, and if it stayed together- even in the front engined car (P25) – it could have seen off the Ferrari on most circuits. The Ferrari had a tiny advantage on ultimate top end, but more often than not the BRM could meet it on lap times. 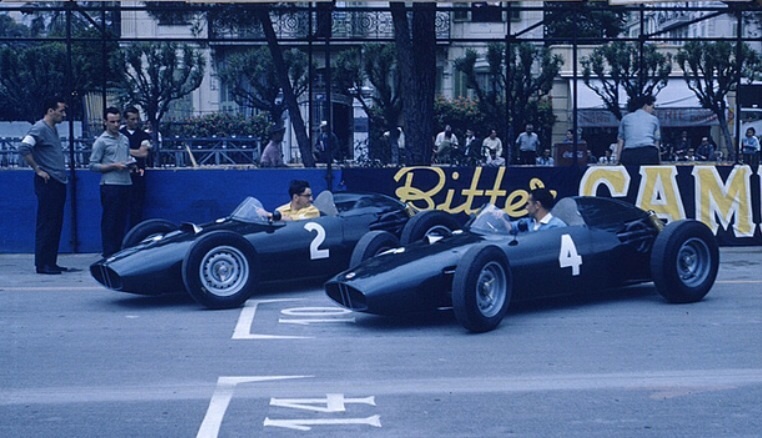 Since the BRM engine was stronger than the Climax also, we should have been in pretty good shape all season in 1960- but it’s perpetual delicacy had ruined our season’. ‘On handling, the BRM’s were not generally as forgiving as the Ferrari’s, even though their ultimate limits were about the same. Even the front-engined BRM had a nasty streak in it, I think, like if you got it too far sideways, it could easily get away from you’. 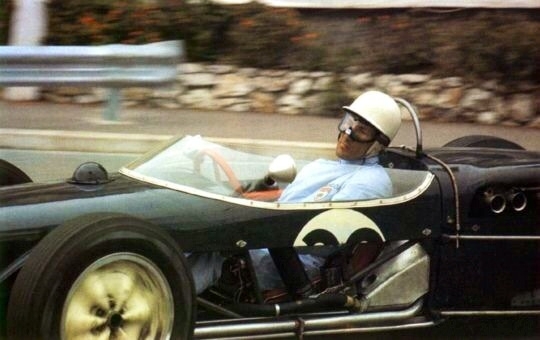 At the 1960 F1 seasons end, chassis ‘485’ Hill and ‘486’ Gurney and ‘484’ Bonnier were shipped to California for the US GP at Riverside, qualifying 3rd Gurney, 4th Bonnier and 11th Hill. Doug Nye wrote a summary of the cars which was posted on The Nostalgia Forum in 2003. I have in some cases truncated, and in other cases added to DCN’s original narrative. The then current owners have most likely changed but that information is of far less relevance than the chassis’ ‘in period’ history. Any errors are mine. 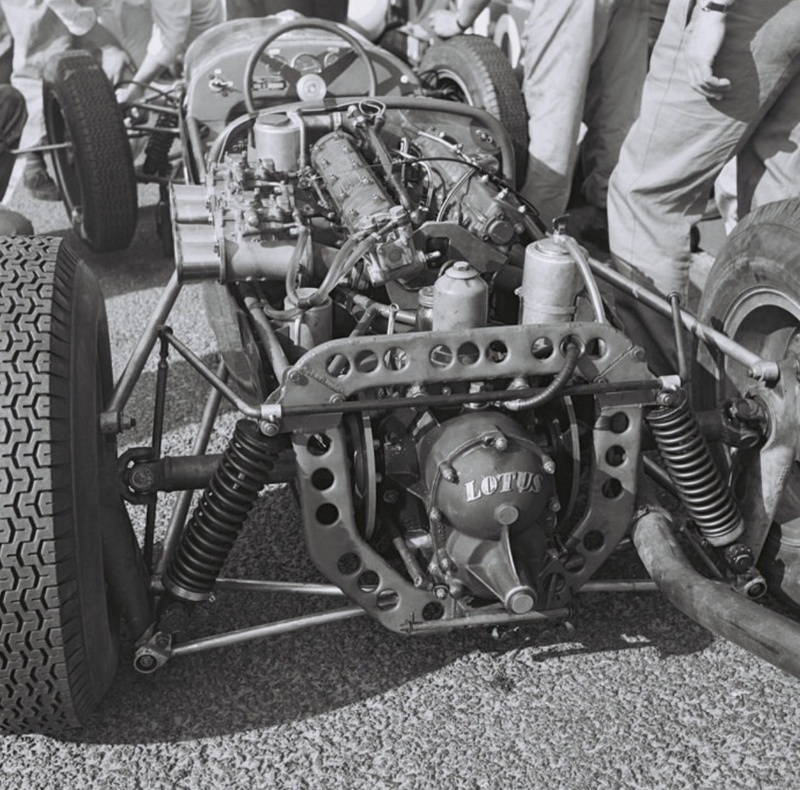 481 – strut-rear suspension, 3-brake (just the ‘bacon slicer’ on tail of gearbox at rear) never raced, but practiced at Monza in September 1959 prototype. Scrapped. I’ve made mention throughout the article of the Cooper T53 and Lotus 18, respectively the World Champion car and ‘F1 Car of The Year’. Here are some great photos by Dave Friedman taken at Monaco (T53) and Zandvoort (18). 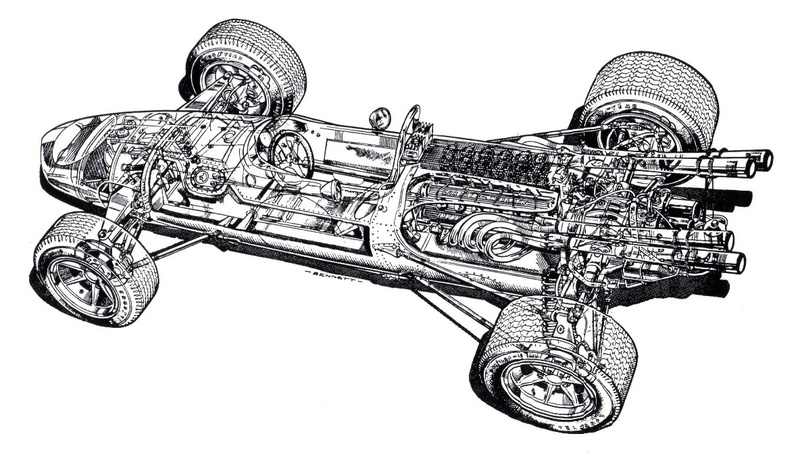 The relative engineering sophistication of the Lotus 18 is clear in terms of its chassis. 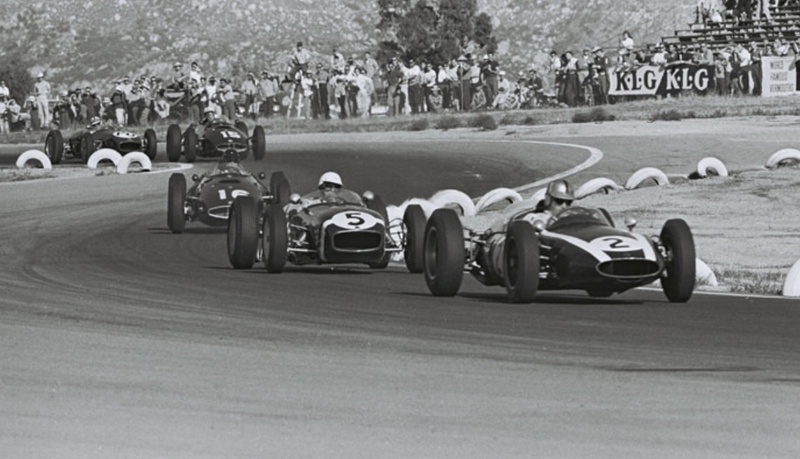 However ‘edgy’ Chapman’s sequential gearbox was, it was also the cars Achilles heel- which left the evolutionary, John Cooper, Owen Maddock and Jack Brabham designed, built and sorted T53 to take championship honours. 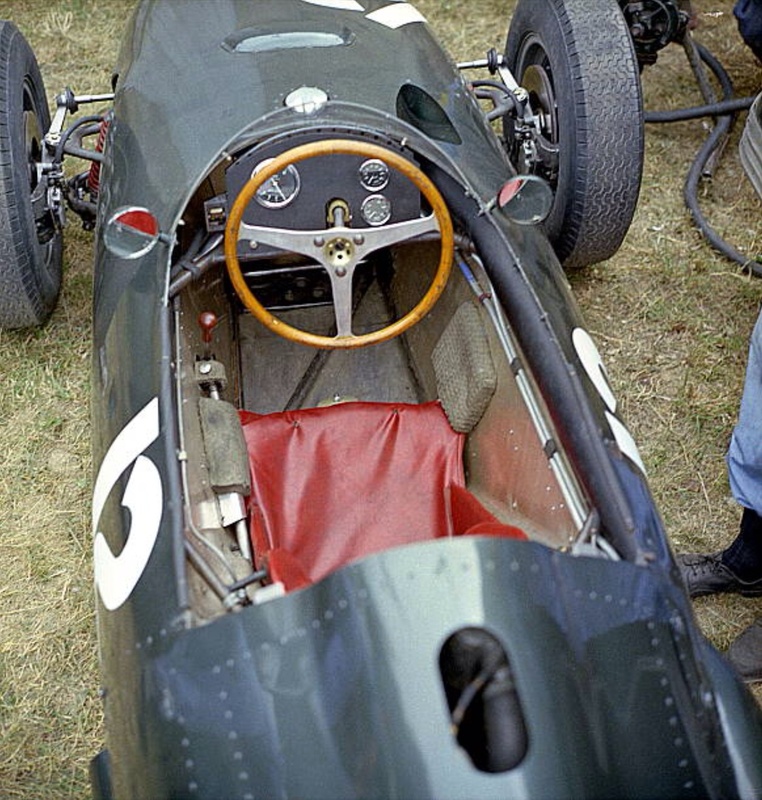 The ultimate GP car of 1960 would have been a Lotus 18 FPF to which was bolted a Cooper C5S gearbox- Moss would have disappeared into the sunset with such a car! 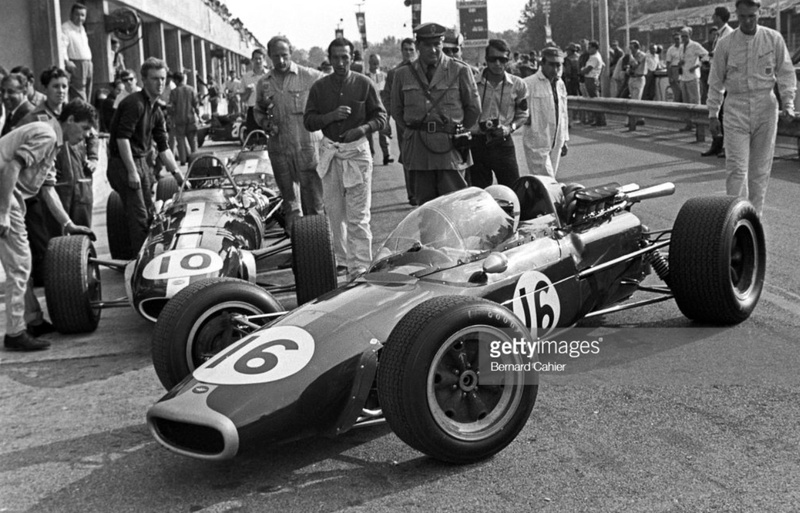 Lotus 18 Climax FPF 2.5..
Cooper T53 Climax FPF 2.5 ‘Lowline’..
Posted: July 11, 2016 in F1, Who,What,Where & When...? He retired from the race won by Graham Hill’s Lotus 49B. Moser is one of those privateers who so enriched GeePee racing in the days when such things were allowed, encouraged even. 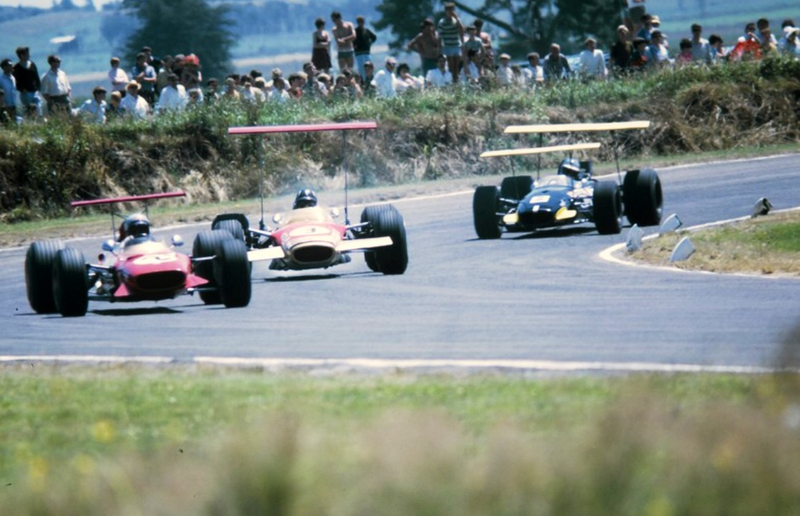 Silvio was keen on Brabhams, he raced an ex-works BT20, Denny’s chassis ‘F1-2-6’ in 1968 before buying the car above, BT24/3 after Piers Courage raced it in the 1969 Tasman Series. It was the last of the BT24’s built, Jochen Rindt raced the 1967 championship winning design during early season ’68 Grands Prix whilst Jack tried to coax some reliability from the quad cam, 32 valve, powerful but problemmatic ‘860 Series’ Repco V8 engined BT26. 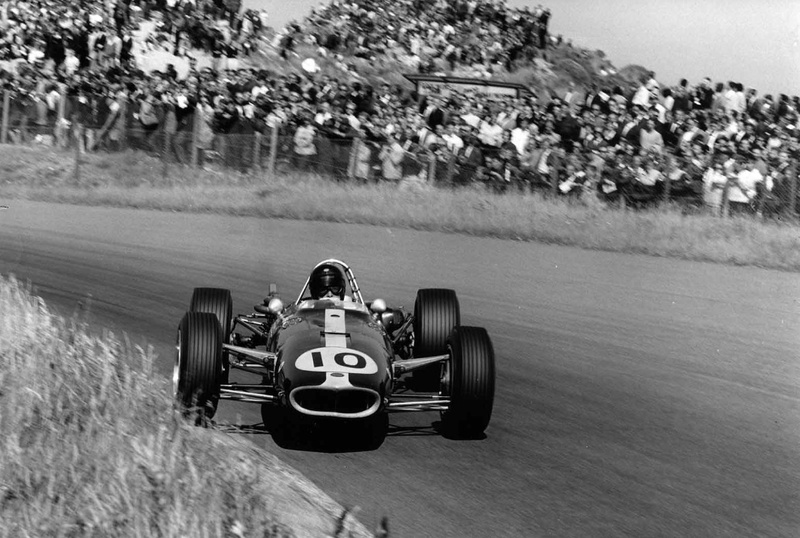 Dan Gurney also had a steer, the lanky Californian crammed himself into the car at Zandvoort (below) then Kurt Ahrens raced it to 12th in the German GP, the cars only GP finish in 1968. 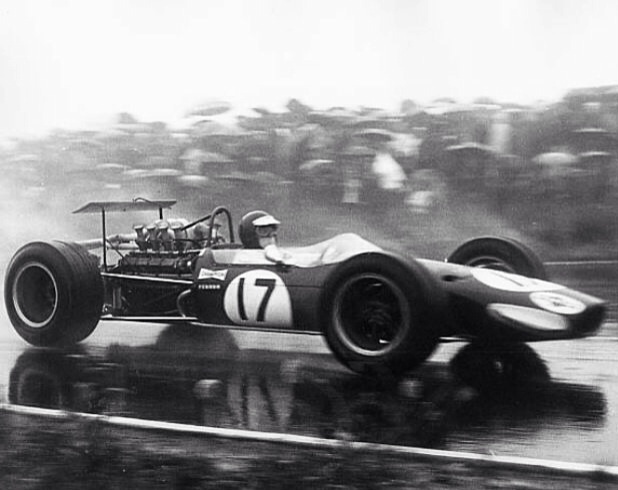 Kurt Ahrens (below) in BT24/3 during the awfully wet German GP at the Niuburgring, Jackie Stewart triumphed in his Matra MS10 Ford aided by some trick Dunlop wets. Kurt was on Goodyears, finishing 12th in a one off drive on home turf. The cars spec was ever evolving, check out the wing package, the same as that used on the factory 1968 BT26’s, Nurburgring was the only race of the year in which both Jack and Jochen finished a race in the fast but unreliable BT26. Kurt’s cars wing has ‘Fosters Flop’, it’s in full droop mode, the simple support bracket having come adrift on the bumpy Eifel Mountains course. 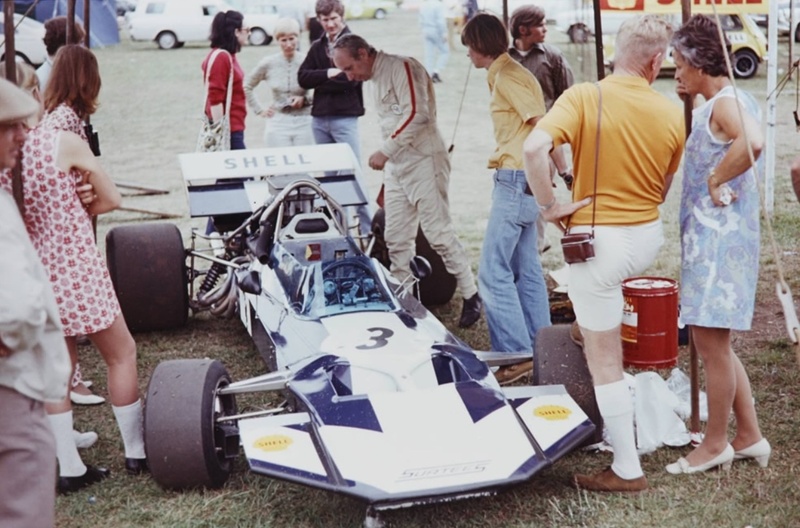 Frank Williams then bought the car and converted it to Tasman spec by fitting a Ford Cosworth DFW V8, the 2.5 litre variant of the famous DFV. Piers did well in it in the Antipodes, his best result 1st at the Teretonga International on 25 January 1969. 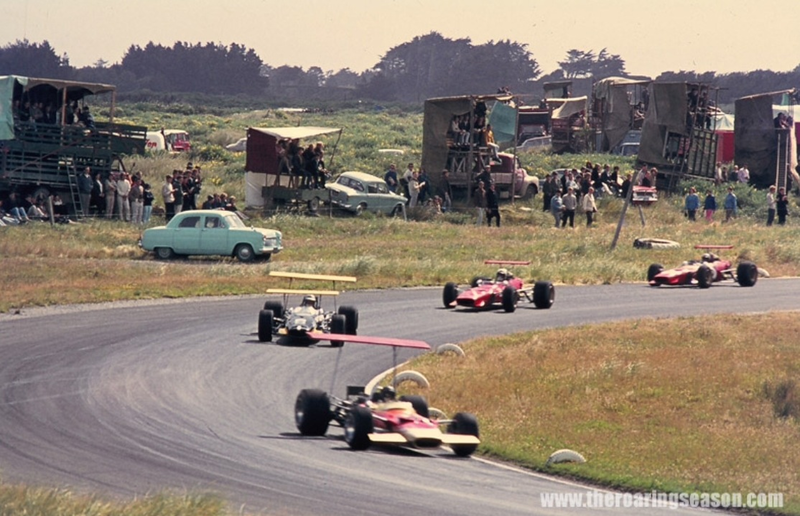 Here (below) he is behind Jochen Rindt’s Lotus 49 DFW and the Ferrari 246 T twins of Chris Amon and Derek Bell, the ‘flash’ grandstands nicely juxtaposed against the cars. Might be on the warm up lap as Jochen’s driveshaft failed on the line, the cars are in grid order. And below Bell’s Ferrari 246T from Hill’s Lotus 49B and Courage’s BT24/3. Courage won from Hill and Amon. Variety of approaches to wings interesting, checkout that crowd and the el-casual vantage points. 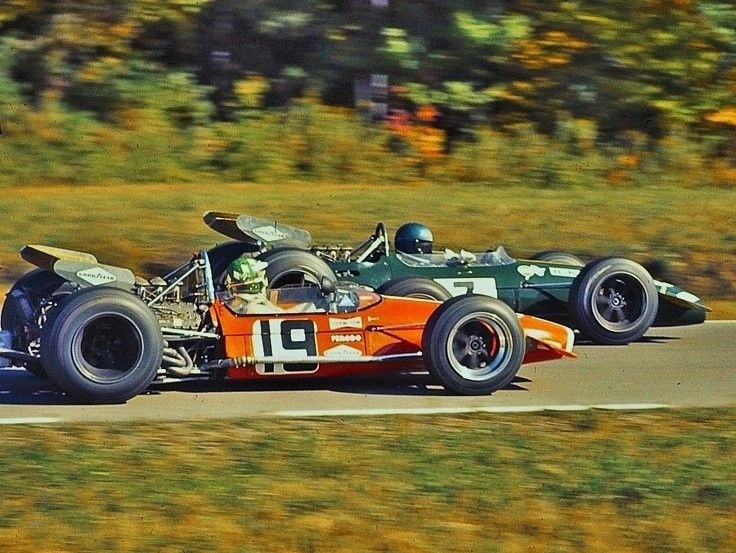 Courage had a sensational season driving another ex-works Brabham, a BT26 adapted to accept a DFV, he established himself as an F1 front runner in 1969, 2nd at Watkins Glen to Jochen Rindt the seasons highlight. Frank Williams popped the BT24 into Autosport after the Tasman to sell it, Silvio the eager purchaser. 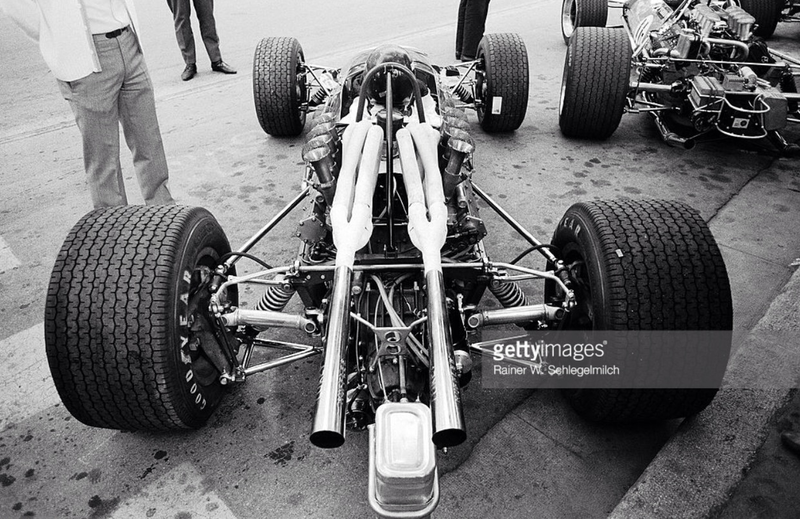 All the hard work had been done, he bought a DFV and slotted it into the spaceframe whence the DFW had been. He needed more tankage though, Tasman races were 100 miles, GP’s 200 miles, hence the pannier tanks, ok for 1969 but no-go in 1970 when ‘bag tank’ rules came into being. BT24/3 still exists in Switzerland, there is also a replica tagged 24/3. 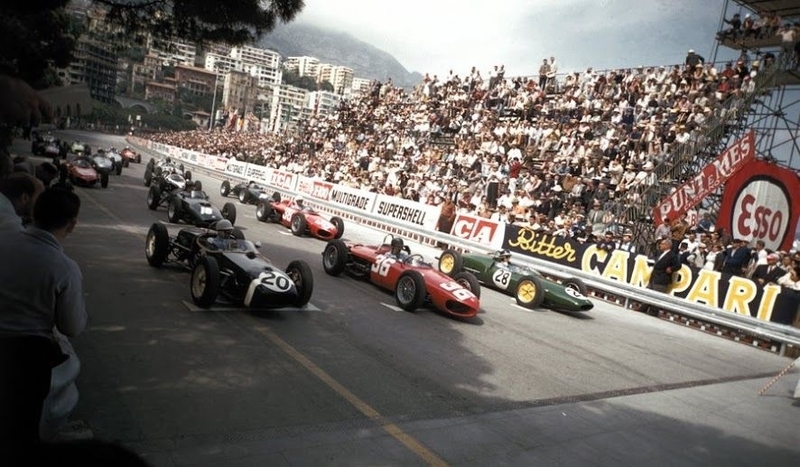 1961 was the first year of the 1.5 litre F1; Ferrari were dominant with their powerful 156’s, the little V6 was the most potent engine, the chassis not a patch on the best of the Brits but overall the Scuderia had a great year. However, the mastery of Moss prevailed several times during 1961. 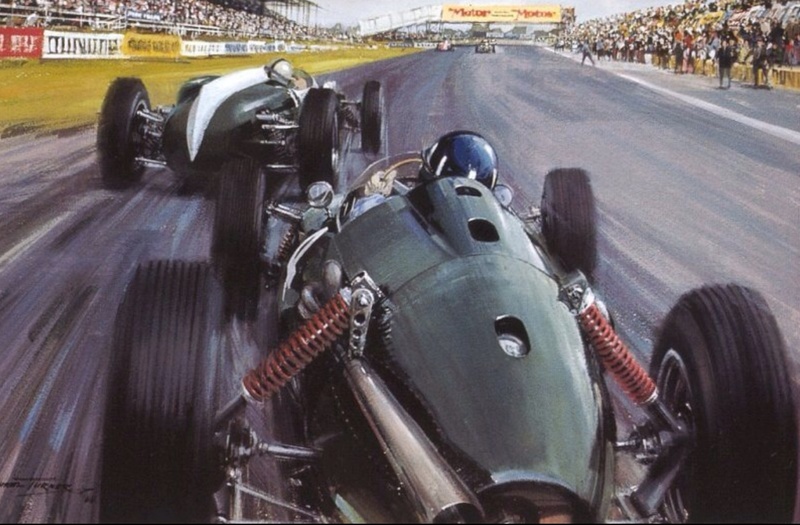 The first of these performances in his lithe, nimble 1.5 Coventry Climax Mk2 engined Lotus 18 is portrayed in the season opening event by John Ketchell’s art. The great cockpit view shows Moss chasing Jack Brabham’s Cooper T55 Climax and Richie Ginther’s Ferrari 156.